“Adrenal Fatigue”… “Adrenal Burnout”… “Adrenal Exhaustion.” That’s the story we’ve all been told about what causes chronic fatigue. It’s that chronic stress wears out our adrenal glands and causes them to be unable to produce enough cortisol, and then we get fatigue and all sorts of other symptoms. But is Adrenal Fatigue real? Since the term “adrenal fatigue” was coined in 1998, the theory of adrenal fatigue has gained enormous popularity and is now believed by millions of people all over the world. Yet, at the same time, “adrenal fatigue” is actually not accepted as a legitimate medical condition by conventional medicine. So how can it be that a theory which is so popular among natural health practitioners and millions of people in the general public not even be accepted as a real medical condition by conventional MDs? Is adrenal fatigue real? Given how controversial this condition is, we need to take a closer look at the science to find out whether the research supports the idea that adrenal fatigue/cortisol abnormalities really are the major player in chronic fatigue. This article is the most comprehensive analysis of the scientific research from the last 20 years that has examined the link between cortisol levels and chronic fatigue. My hope is that this information will start to shift the paradigm among the natural health community, and to help individuals like yourself find the best, evidence-based path to fixing your fatigue. What is Adrenal Fatigue? And What Are The Symptoms of Adrenal Fatigue? The Overall Body of Scientific Evidence – What do the 79 Studies Say About The Link Between Cortisol Levels and Fatigue? Does The Research Support The Predictions of Adrenal Fatigue or Not? It is largely based on a researcher Hans Selye’s work from the 1930s-1950s, where he did testing on lab animals put under extreme stress. He found that they go through different phases of in their response when exposed to chronic stress, and then ultimately sort of shut down and are unable to maintain normal health – i.e. symptoms emerge. He proposed that these changes seemed to coincide with certain changes in hormones like adrenaline and cortisol along 3 specific phases, that ultimately ends in system-wide failure. Adrenal fatigue proponents took Selye’s research and applied it to chronic stress in humans. Selye’s work was then used as support for the adrenal fatigue theory, and the idea that low cortisol (i.e. burned out adrenals) specifically is the fundamental cause of chronic fatigue and other symptoms that can emerge with chronic stress. The adrenal glands produce stress hormones (like cortisol) to respond to periods of stress. 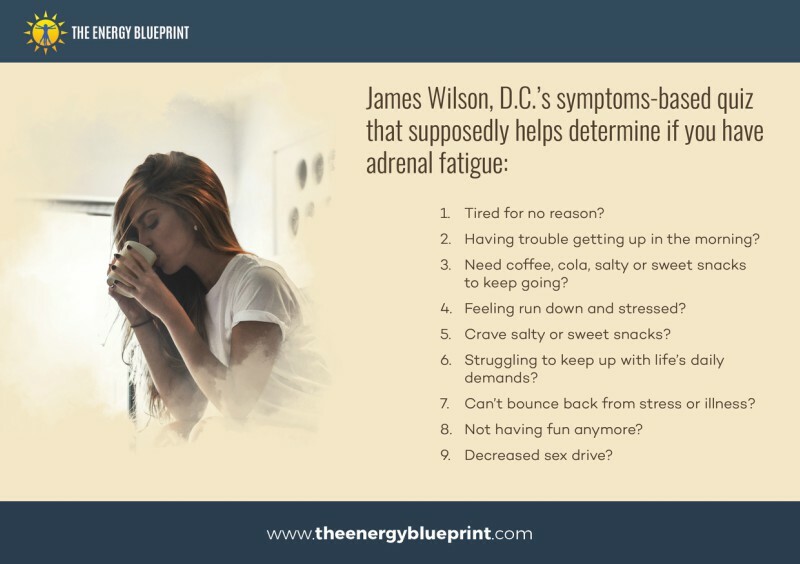 Normally the system works just fine, but when the stress becomes chronic, the adrenal glands get worn out and “fatigued” so they can’t produce enough cortisol to keep up with the demands. Then you get fatigue and other symptoms. Alarm reaction– This stage is the body’s initial response to stress, which involves the adrenal glands producing lots of cortisol. 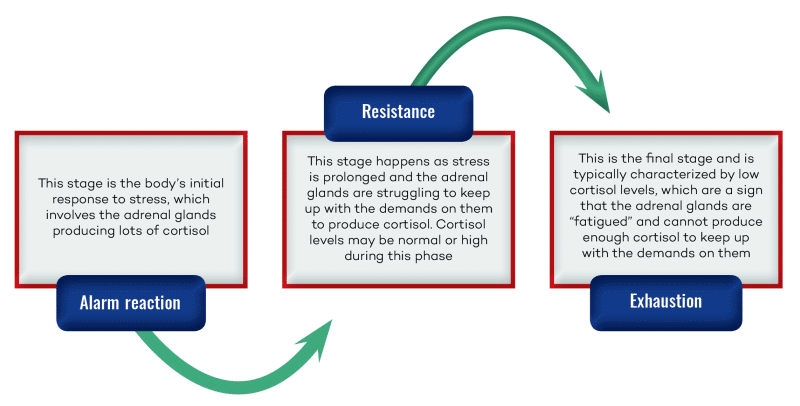 Resistance– This stage happens as stress is prolonged and the adrenal glands are struggling to keep up with the demands on them to produce cortisol. Cortisol levels may be normal or high during this phase. 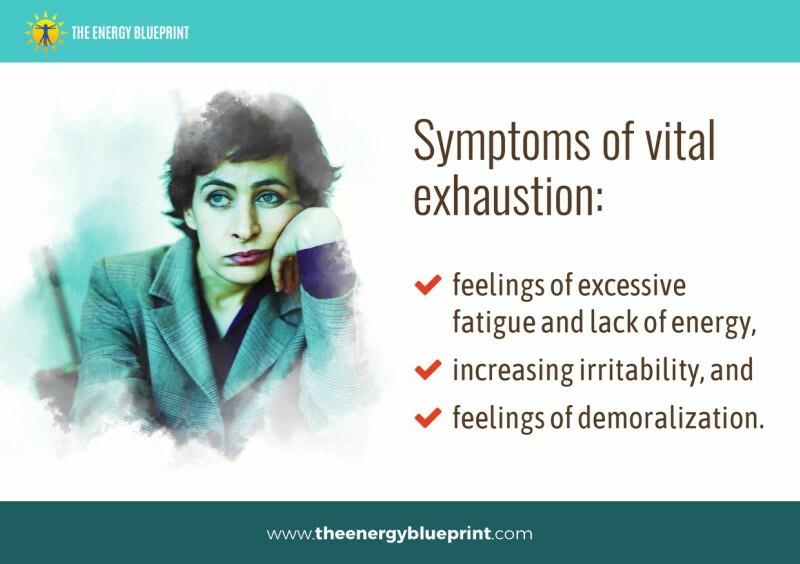 Exhaustion– This is final stage and is typically characterized by low cortisol levels, which are a sign that the adrenal glands are “fatigued” and can’t produce enough cortisol to keep up with the demands on them. That is the basic theory of adrenal fatigue. It seems like a logical concept, and perhaps that is why it has become such a popular idea. 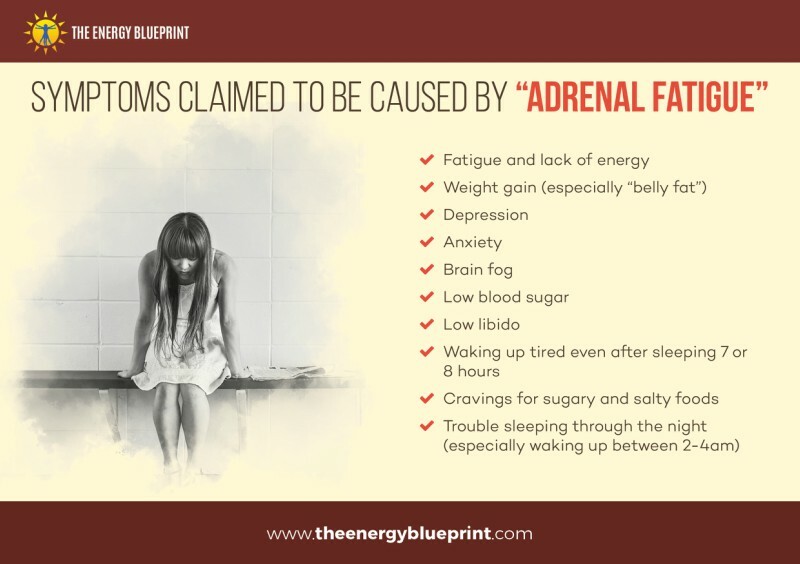 While this theory of adrenal fatigue has many people who believe in it and preach it, there are numerous problems with it. As you’re about to see, based on research that has been conducted over the last 25 years, the evidence simply does not support the idea that adrenal function and cortisol levels are key players in chronic fatigue. The concept of adrenal fatigue is commonly taught among naturalistic and holistic health practitioners, and is commonly believed by virtually all health seekers in the general public. There are literally thousands of articles online and dozens of books written about “adrenal fatigue.” So of course, it must be a real thing, right? Yet, if you are under that impression, it might interest you to know that adrenal fatigue is actually not even accepted as a legitimate medical condition by conventional medicine. Adrenal fatigue proponents (most of the natural health community). These are the people writing articles and books about adrenal fatigue, and claiming to treat it. 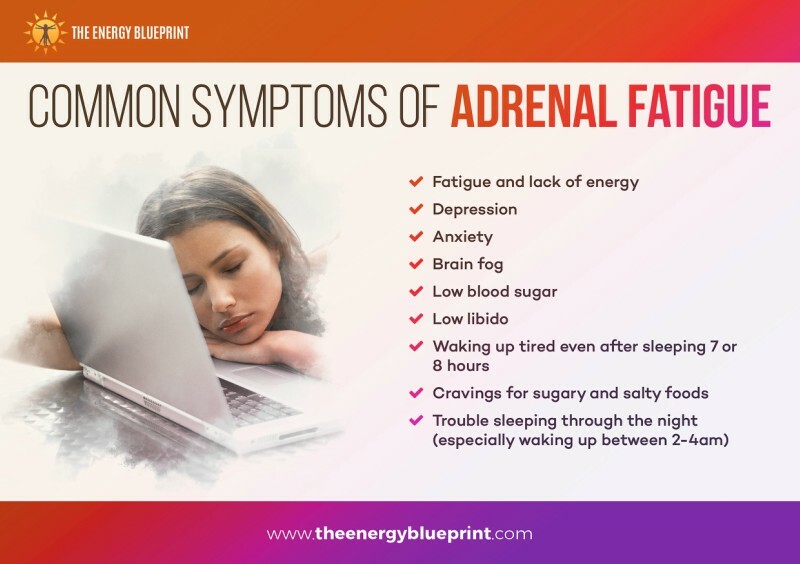 When asked “is adrenal fatigue real?”, they’ll likely chuckle at the thought that anyone could not believe it’s real, because they believe they see it in their clinics all the time. Conventional MDs. These people flat-out reject the notion that adrenal fatigue is legitimate medical condition. When asked “is adrenal fatigue real?”, they’ll most likely chuckle at the idea that anyone believes in it. They believe that the symptoms are not actually caused by poor adrenal function or cortisol issues, and that the science does not actually support the idea that the adrenals/cortisol is a significant cause of those symptoms. Each group of people believes the other group is wrong and simply doesn’t understand what is really going on. Ask a conventional MD what they think of people who believe that adrenal fatigue is real and they’ll typically say that they’re quacks. Ask an adrenal fatigue proponent what they think of the conventional medical views on adrenal fatigue, and they’ll typically claim that it’s because the conventional medical world isn’t yet as scientifically advanced as they are, and hasn’t yet figured out that the adrenals and cortisol are behind the epidemic of chronic fatigue. So what’s the truth here – is adrenal fatigue real? Is “adrenal burnout” or “adrenal fatigue” or cortisol issues the real cause of your chronic fatigue? That’s what this article will answer, by using the most comprehensive analysis of the science on this topic that has ever been done. Get ready to be shocked, because the science in this area tells an amazing story of what is really going on in chronic fatigue. Within the natural health community, we’ve all been told a narrative of how our adrenal glands and cortisol control our energy levels and are the cause of our fatigue. I myself was brought up with this concept in my education in holistic health. I read many books about adrenal fatigue, was taught about it from my mentors, and even taught the concept to my clients for many years. So when I saw how so many conventional MDs were brushing off “adrenal fatigue” as nonsense, I had an idea to use the scientific evidence to prove that adrenal fatigue is real. I originally started with a simple idea to compile the research in support of adrenal fatigue. I set out to write a book giving an overview of the last 20 years of research into the link between cortisol and fatigue. My goal was simple: To prove scientifically that “adrenal fatigue” is real, is a legitimate medical condition, and that adrenal fatigue is indeed the primary cause of fatigue. If someone wanted to know “is adrenal fatigue real?”, I wanted to create the ultimate science-backed resource for them to know that it is real and backed by research. So I dug into the research and read every study I could find that relates to the link between cortisol levels (i.e. adrenal function) and fatigue. It was a process that took over 6 months of digging through the full texts of hundreds of studies. I discovered that the evidence is wildly contradictory, and simply put, doesn’t actually support the notion that cortisol issues (or adrenal function) is a primary cause of chronic fatigue. I discovered that my assumptions about what I would find were simply… wrong. Now, in this scenario, what most people typically do is they ignore the evidence that conflicts with their views and then they pay attention to and cherry-pick only the evidence that supports their preconceived notions. But instead of doing that, I decided to do something much more difficult: I decided to admit that my preconceived notions were incorrect, and to rethink the causes of fatigue. Then, I decided to do a comprehensive review of every study ever done on this subject and then I would let the science itself tell me what to believe. If the science pointed to the notion that adrenal dysfunction/cortisol abnormalities are found in a large majority of people with chronic fatigue, I would have to conclude that cortisol issues are the primary cause (or at least major player) in fatigue. And if the science showed that adrenal dysfunction/cortisol abnormalities are not found in a majority of people with chronic fatigue, then we have to admit that the science doesn’t support the idea that adrenal fatigue is the primary reason for chronic fatigue. It’s over 20 years of studies. And here’s the most important part: You can verify for yourself that I have not cherry-picked the data – what you’ll find here is literally every relevant study done on this topic during the last 20 years. Please feel free to search for relevant studies that haven’t been included here, if you doubt that I’ve included all the research. This is a scientific review unlike anything that has ever been done before. I have looked extensively in all books on adrenal fatigue and all prominent articles written online, and I have not found a review of the scientific literature related to the concept of “adrenal fatigue” that is even 1/10th as comprehensive as what you’re about to read. This is the most comprehensive analysis of the science on the relationship between fatigue and cortisol that has ever been done. There isn’t any actual research on adrenal fatigue. Think of a medical condition. Diabetes, stroke, Alzheimer’s, obesity, hypothyroidism, celiac disease, lung cancer, depression, schizophrenia, psoriasis, dementia, or even obscure ones like Sjogren’s syndrome. You’ll notice that between hundreds to thousands of studies will quickly appear for each and every one of those conditions. Now, guess how many you’ll find if you look up “adrenal fatigue”? Virtually none. (Feel free to check for yourself). In fact, it’s actually worse than a mere case of there being no scientific research. Why? Because if you do that search, you’ll actually find negative scientific data. That is, you’ll find research examining adrenal fatigue that has concluded that adrenal fatigue is a myth that has no basis in science. “We found an almost systematic finding of conflicting results derived from most of the studies methods utilized, regardless of the validation and the quality of performed tests. Some limitations of the review include: (1) heterogeneity of the study design; (2) the descriptive nature of most studies; (3) the poor quality assessment of fatigue; (4) the use of an unsubstantiated methodology in terms of cortisol assessment (not endorsed by endocrinologists); (5) false premises leading to an incorrect sequence of research direction; and, (6) inappropriate/invalid conclusions regarding causality and association between different information. So here’s the big problem: How can one review the scientific research on a condition that has virtually no scientific research? Here was the key breakthrough: Since we cannot examine research on “adrenal fatigue” per se, we have to search elsewhere for studies that have examined the link between cortisol levels and chronic fatigue. 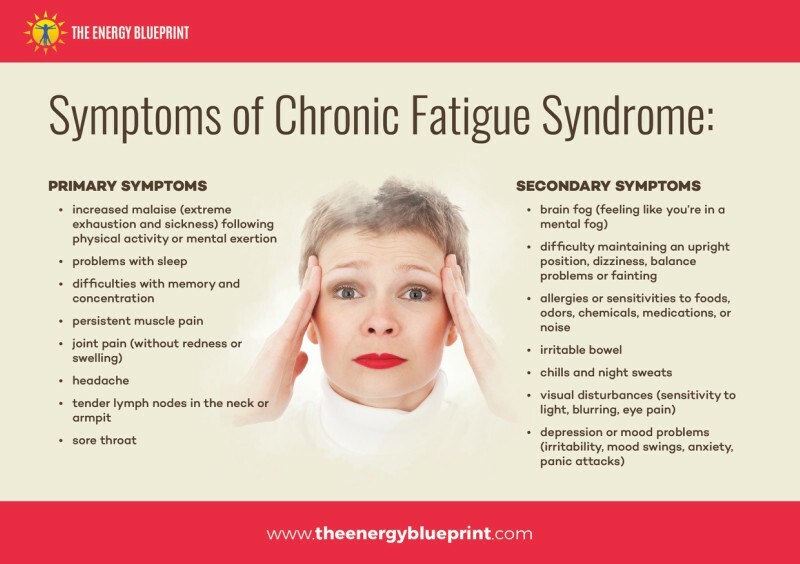 The symptoms of “adrenal fatigue” and “chronic fatigue syndrome” are nearly identical. 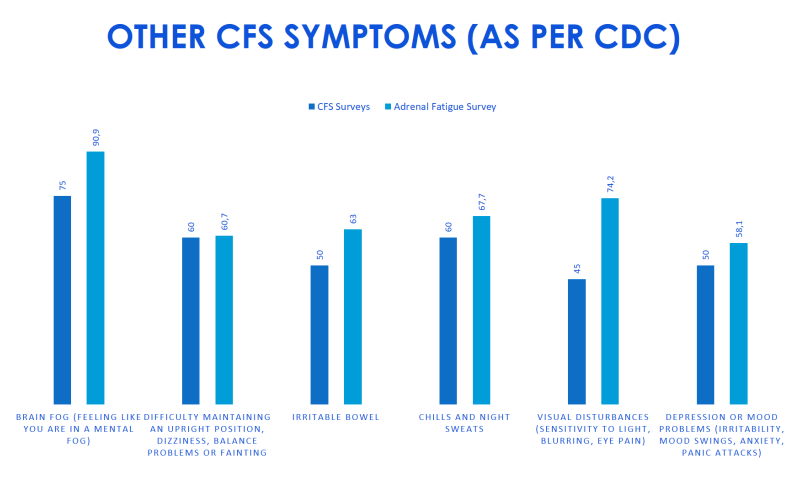 In other words, people diagnosed with adrenal fatigue (or those who self-diagnosed themselves with it) report the same symptoms as those with CFS! The percentages of each symptom are virtually the same! Take a close look at the charts above. Do those really look like two different conditions? I think not. Because there is no clear diagnostic test, these people are all in no man’s land. 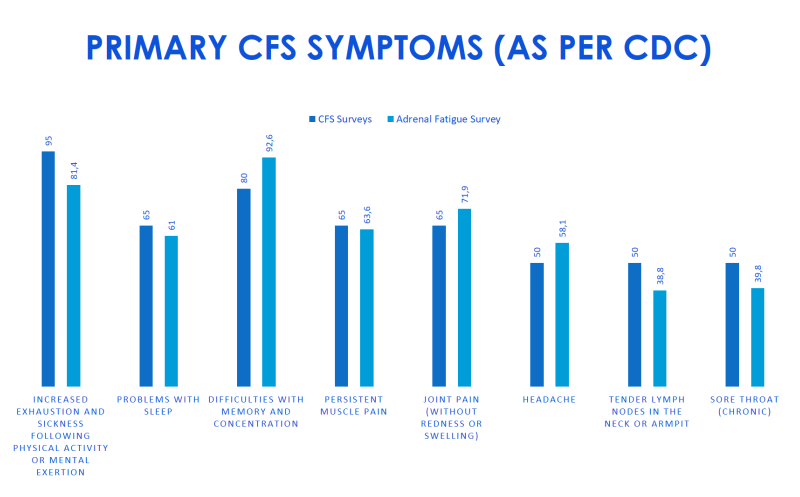 That is, their condition is open to interpretation – and the conventional MDs are likely to give out a diagnosis of CFS whereas the alternative practitioners are likely to say it’s “adrenal fatigue.” (And people are likely to self-diagnose themselves with either adrenal fatigue or CFS, depending on what information they previously came across on the causes of fatigue). The point here is that there is no objective scientific test that can diagnose someone with either adrenal fatigue or CFS, let alone to distinguish between the two. What I am suggesting here is that a huge proportion of people who have these symptoms are simply using different words for essentially the same thing. Alternative practitioners will say it’s “Adrenal Fatigue” and tell you the narrative of how chronic stress wears down your adrenals so they can’t produce enough cortisol. Conventional MDs will say it’s “Chronic Fatigue Syndrome” (or perhaps burnout syndrome or vital exhaustion). 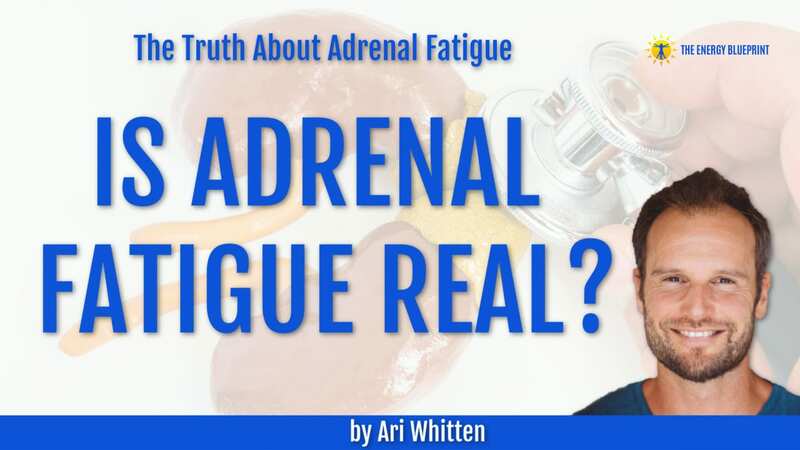 While there is virtually no research in existence on “adrenal fatigue,” there is actually a mountain of evidence from 20 years of research examining the relationship between these fatigue syndromes and adrenal function/cortisol levels. So even though there is no research on “adrenal fatigue,” we can assess the validity of the theory of adrenal fatigue by looking at the dozens of studies that have examined the link between cortisol and chronic fatigue/vital exhaustion/burnout syndrome. Based on the logical assumption that chronic stress might underlie these fatigue syndromes, researchers have been conducting well-controlled studies for over two decades to try to find a link between cortisol levels and fatigue syndromes. There are literally dozens of studies on this that have been conducted by researchers all over the world for over 20 years. And, as you’re about to discover, the results of those studies are wildly contradictory, and the studies have failed to show that abnormal cortisol levels are the primary cause of these conditions. As a whole, the research looking at these 3 fatigue syndromes and their relationship with adrenal function/cortisol levels is all over the place and is massively contradictory. And the majority of studies show that there is no difference in cortisol between people who are burned out or chronically fatigued compared to those who are perfectly healthy. In short, with dozens of studies done on this topic by scientists all over the world for over 20 years, there is no consistent finding of any particular cortisol pattern that is associated with chronic fatigue. Indeed, the data show that for the vast majority of people with chronic fatigue, there is no difference in adrenal function or cortisol levels at all when compared with normal healthy people. PREDICTION #1: We should find that all (or at least a large majority of) people with chronic fatigue/burnout have low cortisol levels (or at least some type of cortisol abnormality). PREDICTION #2: We should find low cortisol levels (or some type of cortisol abnormality) at the onset or early stages of chronic fatigue conditions. 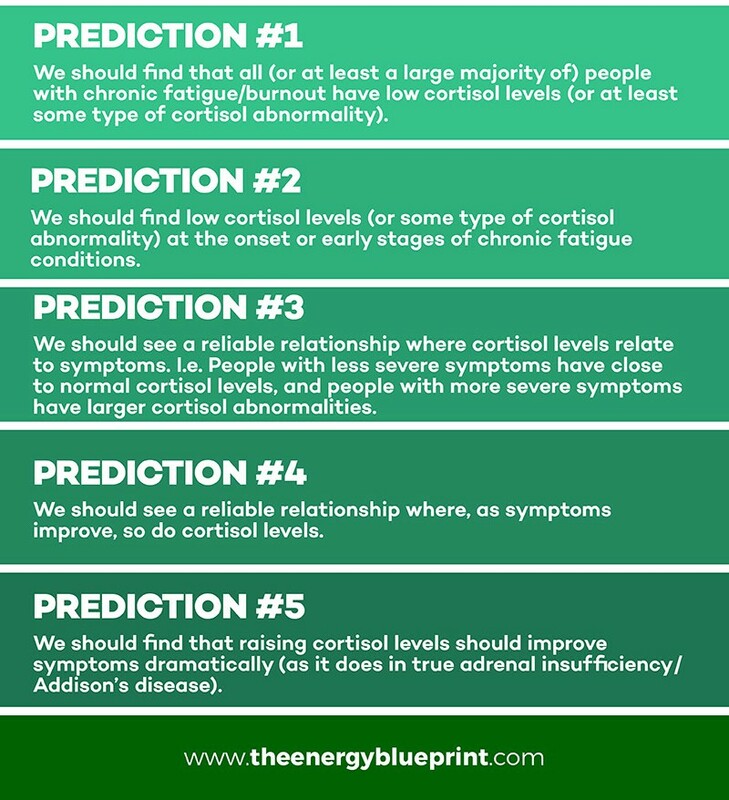 PREDICTION #3: We should see a reliable relationship where cortisol levels relate to symptoms. I.e. People with less severe symptoms have close to normal cortisol levels, and people with more severe symptoms have larger cortisol abnormalities. PREDICTION #4: We should see a reliable relationship where, as symptoms improve, so do cortisol levels. PREDICTION #5: We should find that raising cortisol levels should improve symptoms dramatically (as it does in true adrenal insufficiency/Addison’s disease). As you’re about to discover, the actual evidence does not support any of these five basic predictions of the adrenal fatigue theory. Let me emphasize again that this is essentially the entire body of scientific research examining the relationship of chronic stress and adrenal function. I.e. This is all the studies, so I’m not cherry picking the research to prove some theory—I’m showing you all the studies, including the minority of the studies which do show abnormal cortisol levels. When you look at all the studies – the entire body of evidence – it becomes readily apparent how contradictory all of the findings are. And specifically, it becomes apparent that cortisol abnormalities are not found at all in the majority of people with chronic fatigue or burnout. Now let’s look at the 20 systematic literature reviews on the link between chronic fatigue and cortisol levels. 33 of 59 studies show no significant differences in cortisol levels in people with chronic fatigue/fibromyalgia or burnout syndrome (and/or that cortisol does not change as symptoms improve). 3 of the 10 studies showed a connection between cortisol increases and improvement in symptoms. 7 of the 10 studies showed no connection between fatigue and cortisol changes. The majority of reviews conclude that there are inconsistent and contradictory findings — i.e. some studies show high cortisol is linked with chronic fatigue/burnout, and others show low cortisol, and most do not find any cortisol abnormalities at all. The most common cortisol abnormality is in the direction of lower cortisol. But these changes are small and not found at all in a majority of studies. There is no specific cortisol pattern or change in HPA axis function that is unique to chronic fatigue/burnout. The majority of reviews conclude that people with chronic fatigue/burnout have no adrenal/HPA axis dysfunction and have normal cortisol levels. Now let’s examine a few of the most impressive and revealing studies more in-depth. Now let’s look at some systematic reviews (the highest level of scientific evidence) of the research on the link between HPA axis (hypothalamus-pituitary-adrenal axis, the whole network of brain regions that control adrenal cortisol output) function and chronic fatigue syndrome. HPA Axis dysfunction can be found in a small subset people with chronic fatigue syndrome. Even here though, the research is certainly not particularly compelling that HPA Dysfunction is the cause (or main mechanism) of why people get Chronic Fatigue Syndrome. In fact, the overall body of science makes the case that HPA Axis Dysfunction is likely a result – rather than a cause – of chronic fatigue. Naturally, if HPA-Axis dysfunction were the cause of chronic fatigue, it should be present and detectable in the onset and early stages of the disease. In other words, if populations at high risk for getting chronic fatigue are analyzed, and the researchers can find no link between abnormal cortisol levels and a later risk of getting chronic fatigue syndrome, that is a good indication that cortisol levels/HPA function is not a significant causal factor. Moreover, if people who only recently developed chronic fatigue syndrome are analyzed and no cortisol/HPA abnormalities are found, that is also a good indication that cortisol/HPA function is not a significant player in the condition. It’s not accurate to claim that something is the cause, when that thing isn’t even detectable at the onset or early stages of chronic fatigue. Naturally, if something is not even present at the onset or early stages of the actual condition it’s being claimed as a “cause” of, then one cannot reasonably claim it to be a “cause.” Moreover, if abnormal cortisol levels are claimed as the “cause” of a condition, and it is then discovered that a majority of people with that condition don’t actually have abnormal cortisol levels, then we know that abnormal cortisol levels are clearly not causing the condition. • Roughly 65% or more of people with chronic fatigue syndrome have perfectly normal cortisol levels. The overall body of evidence is contradictory. Studies find low, high, and perfectly normal cortisol levels in people with chronic fatigue/burnout. More than 20 years of research – over 60 studies, and 20 reviews of the scientific literature – have failed to generate any consensus about whether or not cortisol/HPA abnormalities even exist in chronic fatigue/burnout. A subset of people with chronic fatigue syndrome have low cortisol levels and blunted HPA axis activity. Overall, the evidence suggests this is the most common cortisol abnormality in chronic fatigue syndrome, among the minority of patients who have any cortisol abnormalities. (Remember, the majority of people with chronic fatigue have perfectly normal adrenal function and cortisol levels, and still another subset of people have the exact opposite cortisol abnormality). Cortisol/HPA axis dysfunction – even when they do occur in some people – are not present at the onset or early stages of the condition, and thus are likely not “causal.” (But it is certainly feasible that when cortisol abnormalities do occur, in a minority of people with chronic fatigue, they may act as a perpetuating factor in the condition that makes recovery more difficult). There is no specific change or pattern of HPA axis function or cortisol levels in either chronic fatigue syndrome or burnout syndrome. There is no specific pattern of cortisol/HPA dysfunction that is unique to chronic fatigue — the HPA axis abnormalities seen in some patients with chronic fatigue/burnout are also found in many other different conditions that have completely different types of symptoms. Thus, if cortisol levels or HPA axis dysfunction is claimed as a “cause” of chronic fatigue, it should be pointed out that it is extraordinarily unlikely that the same cortisol abnormalities could cause two (or 10) different types of conditions that have different sets of symptoms. There is a lack of longitudinal evidence that links cortisol changes to either worsening or improvement of chronic fatigue. There is little to no evidence that shows any kind of link between cortisol abnormalities causing chronic fatigue/burnout, as well as a lack of evidence showing that normalizing cortisol levels leads to improvement in chronic fatigue/burnout. In other words, more severe symptoms don’t typically relate to greater abnormalities in cortisol levels. And recovering from chronic fatigue/burnout is not typically paralleled by any changed in cortisol. In short, cortisol levels don’t appear to meaningfully relate to symptoms, and thus are unlikely to be the “cause” of those symptoms. Please recall the 5 predictions of the theory of “adrenal fatigue” that we went over previously. As we can now see, none of the basic predictions of the “adrenal fatigue” theory are supported by the body of evidence. In summary, the evidence does not support the theory that cortisol levels (or adrenal/HPA axis function) are a significant causal factor in chronic fatigue/burnout, and much evidence contradicts that conclusion. Beyond the simple fact that the research doesn’t support the notion that cortisol abnormalities have a clear link with chronic fatigue/burnout, there are also a number of other areas where the theory of “adrenal fatigue” is contradicted by the scientific evidence. Specifically, there are four more big problems with the theory of adrenal fatigue. Below are several pop-out boxes that go into detail on several other concepts showing that chronic fatigue is likely not being caused by any sort of adrenal dysfunction or cortisol abnormality. (Note: Click on the links below to open up the explanations for each problem). Here’s a simple way to test the theory of adrenal fatigue: If “fatigued” adrenals that aren’t producing enough cortisol is the fundamental cause of the symptoms, then increasing people’s cortisol levels should make them better. For example, in true adrenal insufficiency/Addison’s disease (an accepted medical condition, in contrast to “adrenal fatigue) where people truly have low cortisol levels, we know that administering synthetic cortisol (e.g. hydrocortisone) actually does have amazing, life-transforming benefits. It is a life saver for people with low cortisol levels. This is indeed a very simple way to test the theory. If low cortisol levels are truly the fundamental problem in chronic fatigue, then raising cortisol levels should fix the problem (just as it does in Addison’s disease). And many prominent proponents of “adrenal fatigue” actually do precisely that – they attempt to treat people with hydrocortisone or other forms of cortisone/cortisol to artificially raise cortisol levels. This idea has actually been around for a long time. It was popularized by the book “Safe Uses of Cortisol” by Dr. William Jeffries. According to Jeffries, the problem here was too little cortisol, and thus, the solution he proposed was to administer synthetic cortisol (e.g. hydrocortisone) to increase a person’s cortisol levels. Indeed, many alternative health practitioners still do use this approach, based on this thinking that lowered cortisol levels are causing the symptoms. But the research shows that it doesn’t work, and that it often makes things much worse in the long-term. Cortisol is a powerful anti-inflammatory, so suppressing inflammation by pumping extra cortisol into the body can cause some initial benefits. (Think of how heroin or opium may have some initial benefits, but is not actually moving you towards health in the long run). The placebo effect will cause some subset of people to feel better with any medication (or even no medication at all – a sugar pill). But what the research has shown is that when people with chronic fatigue (even the small segment who do have low morning cortisol levels) take external cortisol, it does not have significant benefit (and may even cause harm in the long run). Study 1 – 70 patients were randomized to receive either hydrocortisone or placebo treatment for 3 months. They found a significant improvement in 66.7% of patients taking hydrocortisone, and 54.3% of patients on placebo. Benefits were greater in the hydrocortisone group, but there was a remarkable amount of people reporting improvement on placebo, which is suspect. There was small improvement in a rating of “global health” but no significant change in ratings of fatigue for people taking hydrocortisone for 3 months. Study 3 – This was the most recent, the most well-designed, longest duration, and the most conclusive study. It was a double-blind, placebo controlled, crossover-design 6-month study with 80 people with CFS. (Note: “Crossover” means that the same individuals spent 3 months on placebo and 3 months on the cortisone treatment). The study put people on 3 months of placebo treatment and 3 months of active treatment with hydrocortisone and fludrocortisone. So even for that small subset of people with chronic fatigue who genuinely do have low cortisol levels, supplementing with external cortisol to raise cortisol levels back to normal still typically doesn’t give benefit. “We found that low-dose hydrocortisone treatment has mild side effects and affords minimal therapeutic benefit for CFS, but significantly suppresses adrenal responsiveness.” (Note: Your adrenal responsiveness is critical to coping with stressors, so it’s potentially very problematic to do things which prevent the body from adequately responding to stress). Overall, the research does not support the idea that cortisol levels are the primary factor causing fatigue and other symptoms in people with chronic fatigue syndrome. Correcting cortisol levels via medication does not improve fatigue for the vast majority of people. This is why it is not used as a treatment by virtually all evidence-based physicians. 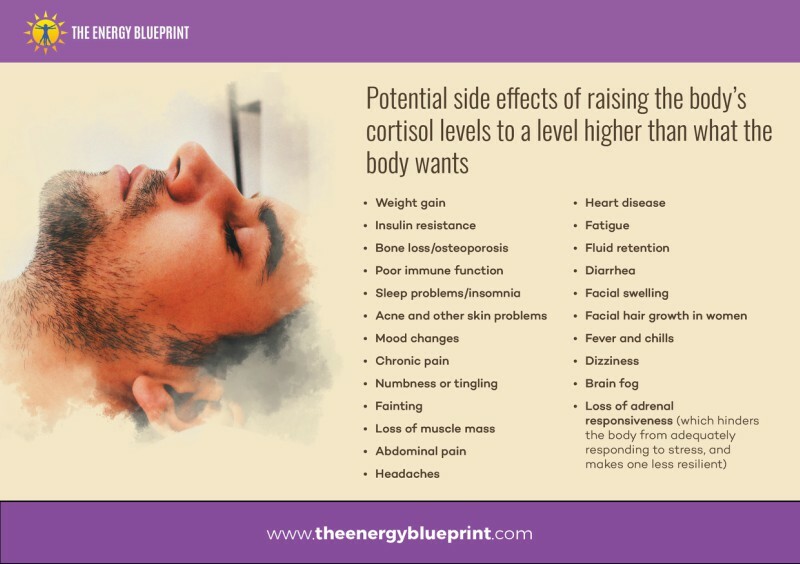 The body is intentionally lowering cortisol levels, and it’s not due to “adrenal burnout” preventing the adrenals from producing enough cortisol. Cortisol is not the primary cause of the symptoms in chronic fatigue. Loss of adrenal responsiveness (which hinders the body from adequately responding to stress, and makes one less resilient). The reason why administering cortisol-raising treatments is not standard practice in medicine for treating chronic fatigue/burnout is because the research doesn’t support it. Correcting cortisol levels has little if any impact on the symptoms associated with chronic fatigue, even in the subset of chronically fatigued people with low cortisol levels. (And it can potentially cause problems). If raising cortisol levels back up to higher levels does not fix the chronic fatigue (or at the very least, provide significant benefit over a placebo), then low cortisol levels are clearly not the fundamental cause of the symptoms in chronic fatigue. As you’ve now seen, there is no particular cortisol abnormality that is reliably associated with fatigue. Indeed, the majority of studies show that the vast majority of people with fatigue have perfectly normal cortisol levels. And yet, a large percentage of alternative health practitioners are attempting to diagnose a specific fatigue syndrome based on cortisol levels. (E.g. “Adrenal fatigue” and “adrenal burnout” and “adrenal exhaustion”). This is pretty crazy if you think about it. There is no other condition in the world where people would insist on using a diagnostic marker that the research shows is so inaccurate and inconsistent. When you’re looking for a diagnostic marker of a disease, you want to use some kind of marker that would show up on a test that would let you know if a person has a particular kind of illness. What you want to find is a reliable diagnostic marker that tells you whether or not someone has that condition. This marker needs to be found in the large majority of people with that condition. And it needs to not be found in the majority of people without that condition. Think about this scenario for a moment: Let’s say you wanted to have a test to see if people have insulin resistance/type II diabetes. Now, let’s say you wanted to do this by looking at fasting blood sugar levels. (That is actually the primary thing physicians look at to assess insulin resistance). Of course, what you expect to find is that people with more insulin resistance have higher blood sugar levels. If that were the case, could you still use fasting blood sugar to diagnose insulin resistance? This is basically the absolute worst diagnostic marker imaginable. They would never use a marker like that – they would throw it out immediately. Why? Because they would recognize that it’s obviously not a valid marker to know whether or not someone has that condition! Yet, that’s exactly what is going on with “adrenal fatigue.” Many practitioners are trying to use a diagnostic marker (cortisol) which simply does not have a reliable relationship to fatigue. There is no other condition in the world where people would claim to use a diagnostic marker for a condition that is claimed to be sometimes high in the condition, sometimes low, and sometimes normal. In such a scenario, it would immediately be recognized that the biomarker is an invalid way of diagnosing the condition. Based on the research into the hormonal profiles of people with chronic fatigue, even in those who do actually have low cortisol levels, the indications are that the body isn’t producing less cortisol because it can’t produce enough (i.e. because the adrenals are “fatigued” as a result of chronic stress), but because the body is instentionally lowering cortisol levels. This is a critical point that often goes unnoticed. To understand this, it requires a bit of understanding of how the HPA axis works. The key point here is that the adrenals (i.e. cortisol levels) are being regulated by the hypothalamus and pituitary. Once we understand this, it tells us something critically important about whether the low cortisol levels are caused by adrenals that are failing to make enough cortisol or if it’s because the brain is intentionally telling the adrenals to produce less cortisol. See, in Addison’s Disease (true adrenal insufficiency), it is truly a case of the adrenals not being able to produce enough cortisol. Because in Addison’s Disease, we see extremely high levels of ACTH. It means that the brain is screaming as loud as it can at the adrenals trying to get them to pump out more cortisol. Normally, more ACTH would lead to higher cortisol levels. 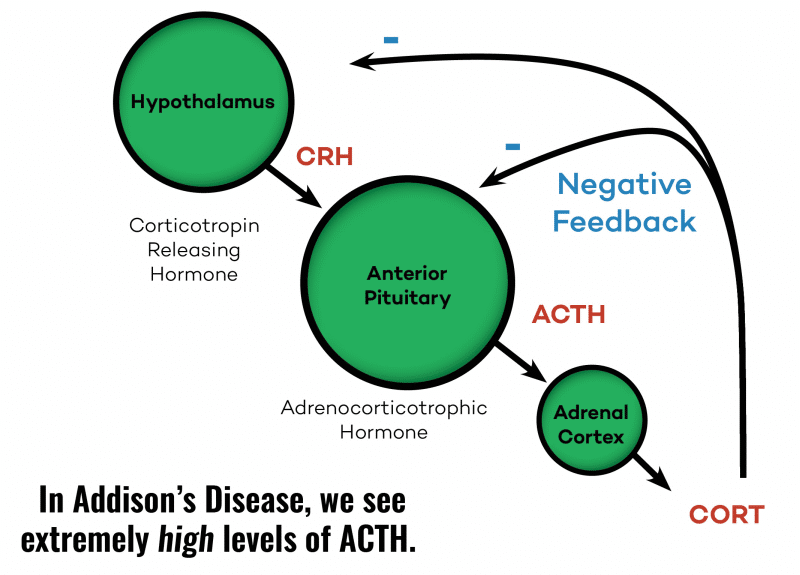 But in Addison’s, the adrenals cannot respond to the ACTH signal and cannot produce enough cortisol. In burnout and chronic fatigue syndrome, we do not see this pattern at all. As explained in the research above, most studies indicate perfectly normal cortisol. Even in the small subset of people with lowered cortisol levels, we see normal or close to normal ACTH. In other words, we clearly do not see a pattern of the brain calling for more cortisol to be produced and the adrenals not being able to produce it. In addition, we also know from research on people with chronic fatigue that even low doses of hydrocortisone (which raises cortisol levels) suppress the body’s own production of cortisol. What that clearly indicates is that the body wants cortisol levels exactly where they are, and trying to raise cortisol will cause the body to fight back and lower its production of cortisol even more. ACTH levels should be high. (They’re not high). Raising cortisol (via hydrocortisone) to normal levels should produce dramatic benefits, and should not suppress the body’s own production of cortisol. (But it doesn’t have either of these effects). In other words, the body is clearly making precisely the amount of cortisol that it wants to have – no more, and no less. So what this means is that in the subset of people with lowered cortisol levels, it appears that the body is intentionally lowering cortisol levels. The body may intentionally lower cortisol to allow the body’s immune and inflammatory system to function in the face of threats: If there are chronic infections and/or toxins being put into the body, cortisol can suppress the immune response too much. Thus in situations where there is a chronic infection present or chronic toxin exposure, the body may intentionally lower cortisol to allow the body’s immune and inflammatory response to function properly. In a recent 2016 study, researchers sought to determine whether the underlying cause in chronic fatigue syndrome is cortisol/HPA dysfunction, or inflammation and oxidative stress. And they showed that the inflammation and oxidative stress causes the HPA axis dysfunction, rather than the other way around. Research has indeed shown that the HPA axis is downregulated in response to chronic inflammation. If one is going to point the finger at some underlying cause, chronic inflammation and oxidative stress are likely better places to look than adrenal/cortisol changes. And to go one step further, the factors causing the inflammatory/oxidative changes. The body may intentionally lower cortisol as a simple consequence of poor sleep and certain lifestyle factors: Research indicates that lowered morning cortisol is not causal in fatigue syndromes, but likely arises as a consequence of a person’s behaviors, physical traits, or the very symptoms of the disease – e.g. disrupted sleep, medications, sedentary lifestyle, or simply being overweight., (We will discuss this in more detail in the next section). The body may intentionally lower cortisol as a way to facilitate the body’s healing response: Some hormone specialists have suggested that lowering cortisol levels is part of the body’s healing response, and that downregulation of the entire HPA axis is part of what happens when the body simply slows everything down to allow healing to occur. (It is hard to objectively validate this with research, but it meshes well with the science and the experience of many clinicians who treat fatigue). In short, the actual hormonal profile of fatigued persons who have low cortisol does not support the notion that their adrenals are “fatigued” and cannot produce enough cortisol. Rather, it indicates that the body wants cortisol levels exactly where they are, and is not attempting to make any more cortisol. We have now seen that while most people with chronic fatigue/burnout have perfectly normal cortisol levels, there is a small subset of fatigued people with lowered morning cortisol levels. To be more specific, the studies which have shown this cortisol abnormality have generally shown that it is specifically the morning cortisol awakening response that differs. (Even in these studies, most of them indicate that cortisol levels at all other times of day are perfectly normal, and that total cortisol output over 24 hours is also normal). And to get even more specific, the claim is that these people have a smaller peak in the rise in morning cortisol levels. So one could perhaps reasonably believe from this that the lower morning peak in cortisol is a sign of “fatigued adrenal glands” that can’t produce enough cortisol, and that this is the real issue causing the symptoms of chronic fatigue/burnout (as some proponents of adrenal fatigue have). 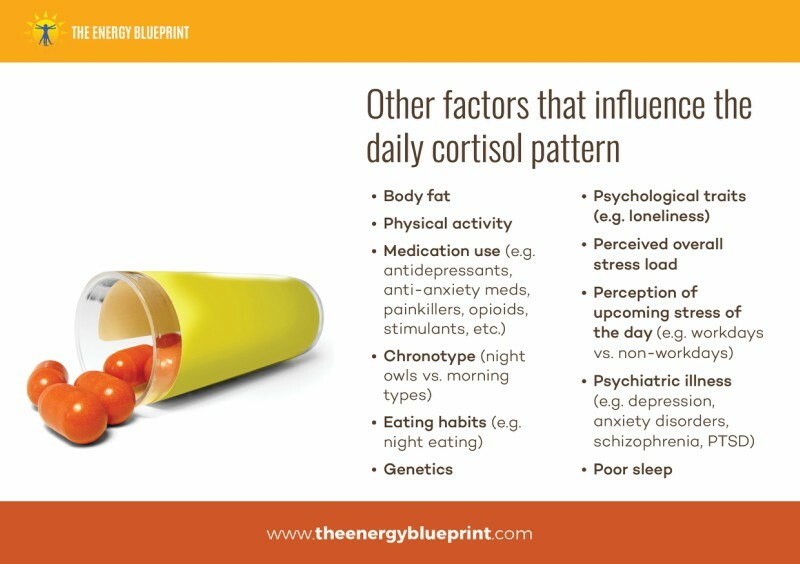 This same exact cortisol pattern is also found in numerous other groups of people without chronic fatigue/burnout. The same exact cortisol pattern can be caused within days of engaging in simple behaviors (i.e. it is not caused by “adrenal exhaustion”). And the same exact cortisol pattern can be caused by some of the very symptoms of chronic fatigue syndrome. Research has shown that the more overweight someone is, the lower their morning peak in cortisol will be. 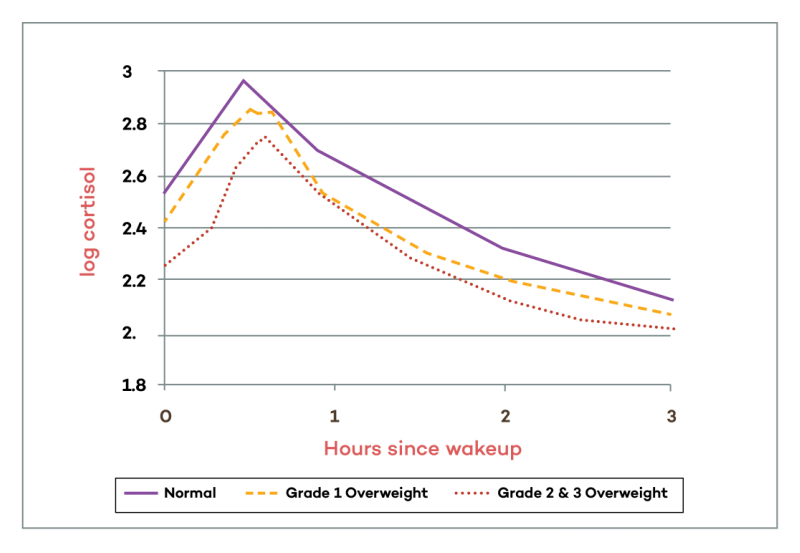 You can see clearly that being slightly overweight causes a slight lowering of morning cortisol, and being significantly overweight causes an even lower peak in morning cortisol levels. Is the low morning cortisol a sign of chronic stress exhausting the adrenals, or simply being overweight? You can see here from this graph how one key study showed that night owls (evening types) have the same exact low morning peak in cortisol. Several other studies have also confirmed this finding. Here’s one study found nearly double the morning cortisol levels in people who were morning types compared to evening types. So again, the simple trait of being a night owl is, by itself, enough to explain why a subset of people with chronic fatigue/burnout have this cortisol pattern. Moreover, research has also shown that being a night owl is associated with many other illnesses, including burnout. Research has also shown that people with CFS tend to have disrupted circadian rhythm, which will lead to this cortisol pattern. So it is likely that a sizable portion of people with burnout/chronic fatigue are night owls, and have this cortisol pattern simply because they are night owls. Research has also shown that the simple habit of late night eating will cause a lower peak in morning cortisol levels. Several different types of prescription and over-the-counter drugs can affect morning cortisol levels. One example is some types of antidepressants. Here is a graph from one study that showed a lower peak in morning cortisol in people on antidepressants. 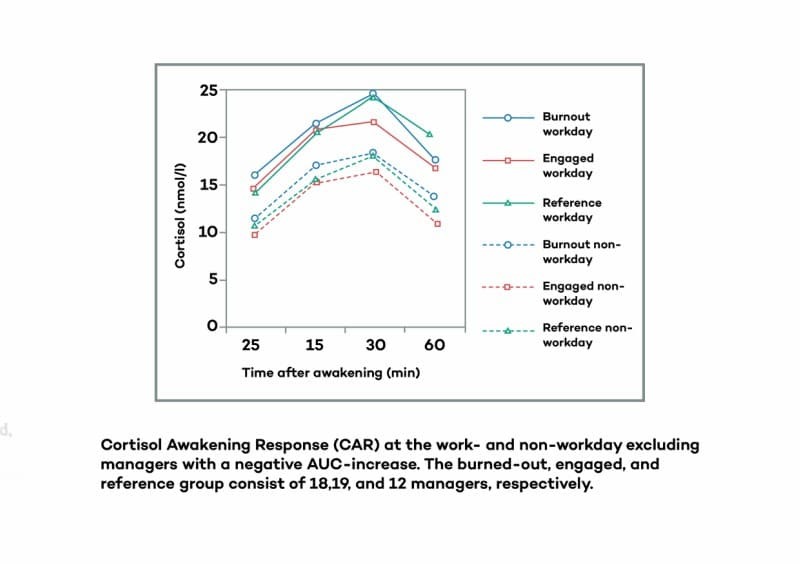 This graph illustrates the morning cortisol awakening response in a group of people with stress-related exhaustion, that only differed based on whether they were on antidepressants or not. Again, both groups had stress related exhaustion, but only the group on antidepressants had the low morning cortisol awakening response. 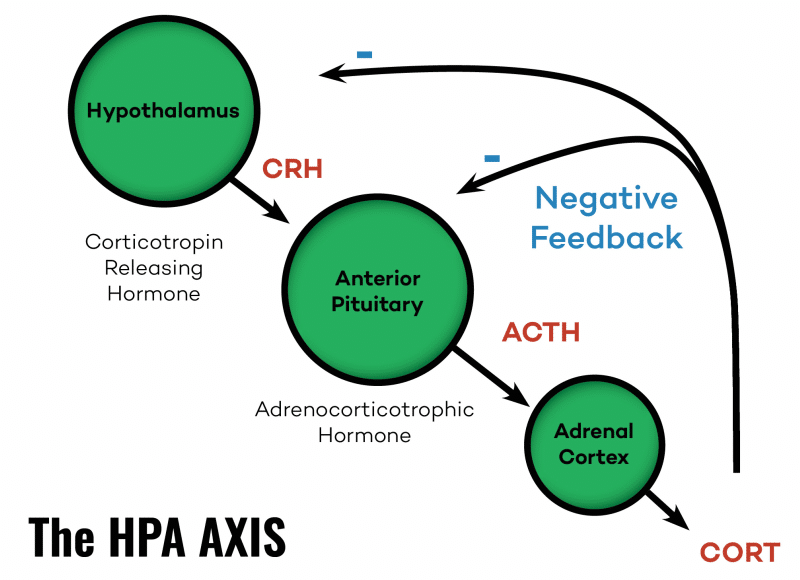 So is the cortisol pattern the result of “adrenal fatigue” or simply taking antidepressants? Several studies have shown that being sedentary can cause a lower morning peak in cortisol levels. Here is one study that looked at people with major depression to examine how their physical activity habits related to their cortisol patterns. Higher physical activity led to a more pronounced rise (awakening response) and fall of daily cortisol levels. Research has even shown that morning cortisol awakening response can be high one day and low the next, as a simple function of whether or not someone has work that day or it’s a weekend. Specifically, having work (and thus a greater anticipated demand of the day) will lead to a higher cortisol peak, and having a day off work leads to a lower cortisol peak. As you can see from the above graph, simply having a day off lowered morning cortisol awakening response in all groups. Importantly, this change occurred from one day to the next, and thus contradicts the notion that it’s chronic stress that causes this lower morning cortisol pattern. If people doing at-home tests take measurements on non-work days, they measure lower than on other days. Patients in chronic fatigue groups likely have more non-working persons compared to healthy people. So the studies comparing chronic fatigue patients to healthy people are confounded by the fact that many people with chronic fatigue will have cortisol patterns that reflect non work days. So is it “adrenal fatigue” or simply a reflection of the perceived demands of the day? This is likely the biggest factor of all. There is no need for chronic stress to exhaust the adrenals – a single night of poor sleep will cause the same exact cortisol abnormality that some people claim to be the “cause” of chronic fatigue. Moreover, it is known that people who develop chronic fatigue syndrome often develop sleep problems. Thus, the sleep problems that emerge in many people with chronic fatigue may actually be the biggest factor in causing the low peak in morning cortisol in some people. Studies have shown that close to 50% of people with chronic fatigue have some type of sleep disorder. One study found that more than 50% of chronic fatigue patients have either obstructive sleep apnea or sleep-related movement disorders (e.g. restless leg syndrome). Another study found that a whopping 46% of people with chronic fatigue syndrome have obstructive sleep apnea. Another large, population study showed that nearly 80% of people with chronic fatigue syndrome experience unrefreshing sleep and 20% had either narcolepsy or obstructive sleep apnea. When you consider how common poor sleep and full blown sleep disorders are in chronic fatigue syndrome – and when you consider that sleep problems alone will cause low morning cortisol levels – it’s actually a wonder that so most studies still show that most people with chronic fatigue have perfectly normal cortisol levels! In short, the fact that poor sleep itself causes low morning cortisol, and the fact that poor sleep is so common in people with chronic fatigue strongly suggests the possibility that the lower cortisol isn’t causing the whole condition, but that low cortisol is simply an epiphenomenon – an effect of one of the symptoms of chronic fatigue: disrupted sleep. In other words, the morning peak in cortisol levels changes from one day to the next according to how much sleep you get. Sleep more and take a nap in the afternoon and you can bring your morning cortisol levels back up to normal the next day. The simple fact is that this one factor – poor sleep – is, by itself, enough to explain why a subset of people with chronic fatigue have low morning cortisol levels. It is known in the research that people who are night owls and/or poor sleepers have higher rates of burnout/chronic fatigue. So we know that if we compare a group of people with chronic fatigue/burnout to a group of normal healthy people, it is virtually guaranteed that the chronic fatigue/burnout group will have more night owls and/or poor sleepers (i.e. people with insomnia). (And it is also extremely likely that the chronic fatigue/burnout groups will have higher rates of the other factors, like antidepressant use, lower physically activity, and excess body fat compared to the general healthy population). Here’s the key point: Simply because the chronic fatigue/burnout group of people will likely have more individuals that have these factors going on – i.e. they are poor sleepers, night owls, sedentary, on antidepressants, or are overweight – these studies are very likely to conclude that overall, people with chronic fatigue/burnout have lower morning cortisol levels. (Since the people with these factors will skew the overall average cortisol numbers of the entire group). Considering how common poor sleep is in people with chronic fatigue, it is actually shocking that most studies still find perfectly normal cortisol levels in the vast majority of people with chronic fatigue/burnout. Indeed, the fact that so many common lifestyle factors (that are known to be especially common in people with chronic fatigue) can induce low morning cortisol levels, and yet, the majority of studies still find normal cortisol levels in most people with chronic fatigue adds further evidence to the notion that cortisol levels are simply not a significant causal factor in chronic fatigue. The point here is to simply say that the proposed cortisol abnormality claimed to be associated with fatigue/burnout (lower morning peak in cortisol) it not actually not unique to fatigue/burnout – it arises all the time in people without fatigue/burnout. Nor is it evidence of “adrenal exhaustion” due to chronic stress – the same cortisol pattern arises in people all the time without any chronic stress over months or years taxing their adrenals. Low morning cortisol levels do not mean that the adrenals have been exhausted and can’t produce enough cortisol – it is often an acute hormonal response to simply being a night owl, being overweight, being a night eater, being on antidepressants, or not sleeping well. It doesn’t even require months or years of these factors – it can arise from simply staying up late the night before, or poor sleep the night before. One can even have a lower morning cortisol peak from simply having a day off of work. In short, low morning cortisol levels are not evidence of exhausted adrenal glands, but may simply be an acute hormonal response to being a night owl, medication use, night eating, being overweight, or poor sleep. Low morning cortisol levels are not present in the majority of people with chronic fatigue/burnout. Low morning cortisol levels are not present at the onset or early stages of chronic fatigue/burnout. Raising cortisol levels (via medication) does not resolve the fatigue or provide any meaningful benefit over a placebo for the vast majority of people with chronic fatigue. (Including those with measurably low cortisol). Low morning cortisol levels can be caused by simply being a night owl, taking antidepressants, being sedentary, being overweight, or not sleeping well. Taken together, these facts make it clear that that abnormal cortisol/HPA axis function is not a primary cause of chronic fatigue. The cortisol abnormalities that do occur in a subset of people with chronic fatigue can also be easily explained. 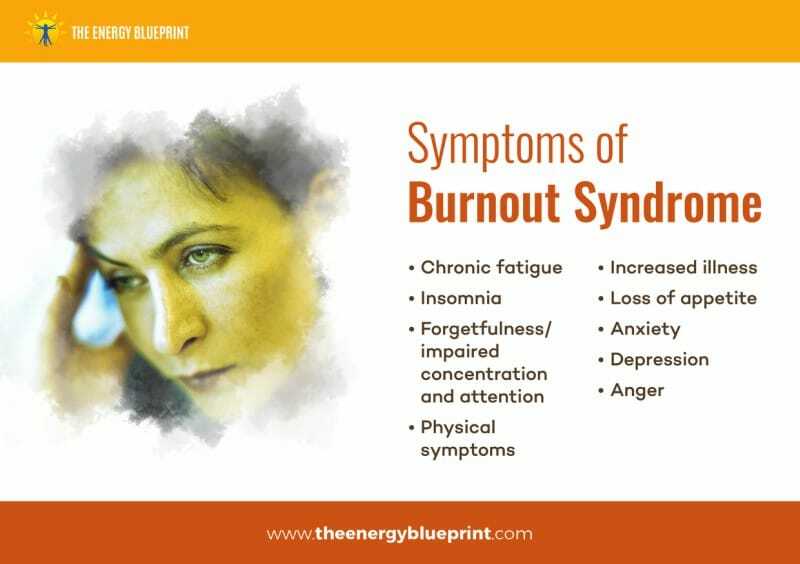 These abnormalities may simply be a consequence of some of these lifestyle and behavioral factors, rather than a cause of the whole condition of chronic fatigue/burnout. And this is why many researchers have concluded that HPA axis dysfunction and cortisol abnormalities are likely not a major cause of chronic fatigue/burnout, but arise as an effect of some of the lifestyle factors (e.g. insomnia, lack of physical activity, medication use, etc.) that commonly occur in chronic fatigue/burnout. So are low morning cortisol levels in a subset of people with chronic fatigue evidence that adrenal fatigue is real? No. While some people believe that a low morning cortisol peak means that a person has “adrenal fatigue,” it may actually just mean that a person has excess body fat, or is sedentary, or is taking medications, or is a poor sleeper, or stays up late (or a combination of those factors). The simple facts presented above can easily explain why a subset of people with chronic fatigue/burnout have a smaller morning peak in cortisol levels. Since cortisol abnormalities are not typically present at the onset or early stages of chronic fatigue, and since cortisol abnormalities are not present at all in the vast majority of people with chronic fatigue, a reversed direction of causation – where cortisol abnormalities are caused by other factors, inactivity, medication use, poor sleep, etc. – is the most compelling explanation for cortisol abnormalities, in the minority of people with chronic fatigue who do have them. (In an effort to keep things organized and easy to understand, we’ve put the following sections in the pop-out boxes below. Please click the boxes below to unveil text for each of the below topics). Interestingly enough, most people who are diagnosed with low cortisol and “adrenal fatigue” or “adrenal exhaustion” don’t actually have low cortisol levels. There are several serious methodological problems in the way cortisol levels are often tested that lead to faulty results. Tests that don’t give the full picture of cortisol amounts. See, there are different ways of measuring cortisol. The practitioners who believe in adrenal fatigue have generally relied on saliva measurements (also called the Adrenal Stress Index). Saliva measurements of cortisol are indeed a valid method of assessing free cortisol. But, it’s important to understand what is actually being measured. Saliva measurements measure unbound or “free” cortisol – i.e. cortisol not bound to a protein carrier molecule. This is only about 3-5% of total cortisol in our body at any moment. The rest of the cortisol may be bound or in some step of the metabolic pathways involved in clearance of cortisol through the urine. So saliva cortisol doesn’t really give the whole picture about total cortisol produced by the adrenal glands. The claim in “adrenal fatigue” is that the adrenals get worn out and can’t produce enough cortisol. Yet, saliva measurements do not allow us to assess the amount of cortisol produced by the adrenals – only the amount of cortisol that is free cortisol in the body at a given time. The ideal marker of total cortisol production in the body is measuring cortisol metabolites (breakdown products) in the urine, because that reflects the other 95-97% of cortisol that our body produces. Simple: Because research has now found that many people who have low cortisol based on saliva tests (and who are told that their adrenals are exhausted and can’t produce enough cortisol) actually show normal or even high total cortisol production. This is clearly a big problem. Why? Consider that many practitioners prescribe external cortisol (hydrocortisone) to people that they diagnose with low cortisol. In this scenario, a person might even be told that their cortisol is low, and then put on glucocorticoid medication or other substances to try to raise cortisol, not realizing that cortisol is already too high. This obviously has the potential to make a person worse. 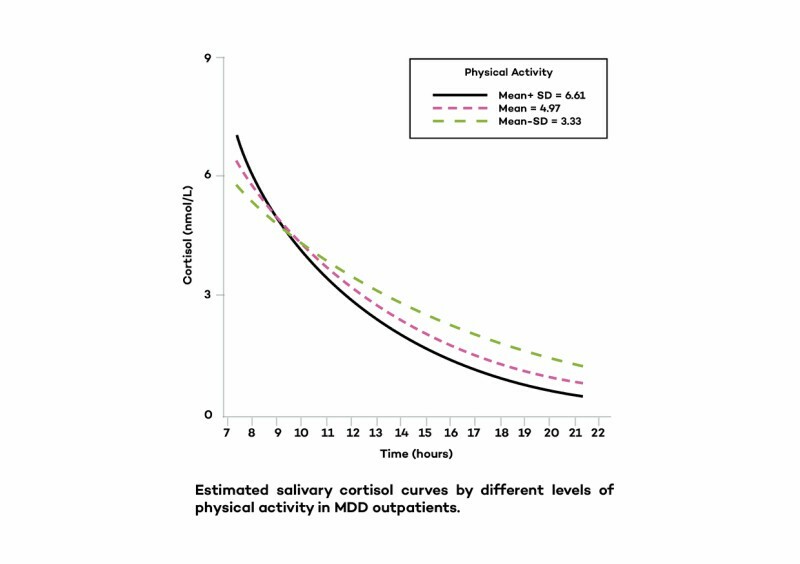 Again, it’s worth emphasizing this because it’s so shocking: It is actually more common for a person with low cortisol on saliva tests to have normal or high total cortisol production, than to actually have low cortisol. This is a fairly straightforward one. Many practitioners only do a single saliva test. This is simply not accurate. Cortisol levels fluctuate dramatically over the course of 24 hours. They even fluctuate dramatically within the span of a single hour, in the first hour after awakening (called Cortisol Awakening Response). So these single measurement tests simply are not accurate measures of anything. To get reliable and accurate measurement of cortisol, one should ideally do multiple saliva tests over the course of 24 hours. Or at least, multiple time points within the first hour after awakening to assess the cortisol awakening response. Some functional medicine labs have revised their “reference ranges” in a very narrow range. The “reference range” is the range of cortisol values that a lab uses to interpret lab results and say what is considered normal, or abnormal. What this means is that by having a narrow reference range, more people will fall outside of the normal and thus will be diagnosed with low cortisol. Many labs have changed the reference ranges in recent years, and these revisions are generally not supported by endocrinologists or based on sound scientific evidence. In other words, some independent labs and individual practitioners simply choose to arbitrarily decide what they believe should be the “normal cortisol” values, and then create a very narrow range for it (much more narrow than conventional endocrinologists) and thus, many more people are diagnosed with abnormally low cortisol levels. Another massive problem with cortisol testing is that because of the huge change in cortisol levels in the first hour after awakening, taking the measurement 30 minutes or 60 minutes later than one was supposed to take it can give a reading that is dramatically lower than the actual cortisol levels. As soon as we wake up in the morning and light enters our eyes, it initially a steep and dramatic rise in cortisol levels within the first 15 to 30 minutes after awakening. This is called the “Cortisol Awakening Response.” (This steep peak in cortisol levels accounts for over 50% of our total cortisol production during each 24 hour day.) Importantly, after the initial hour after awakening, there is a massive and rapid decline in cortisol levels. 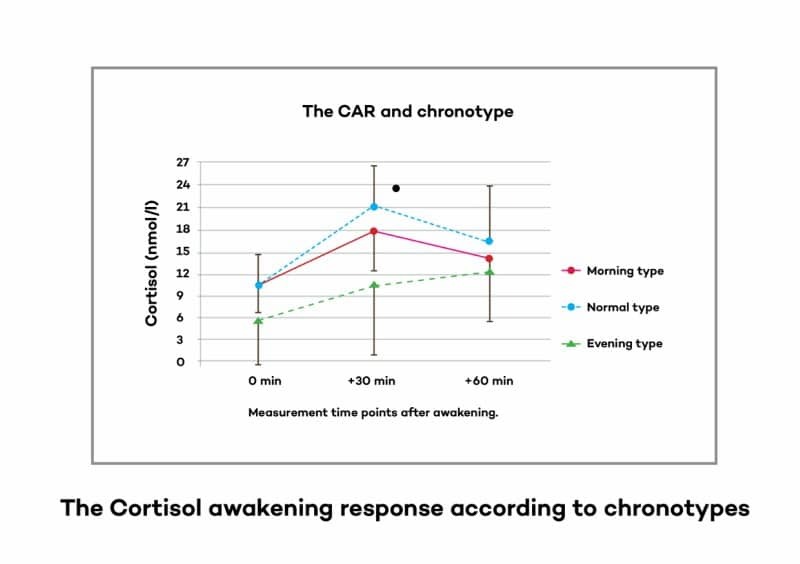 To show you what I mean, take a look at this image of the cortisol awakening response. Do you notice how much cortisol values change in just 30 minutes or an hour? So what would happen if the test is administered just one hour or two hours later than it’s supposed to be? You’d obviously get a wildly inaccurate cortisol level. It turns out that this is exactly what has happened on a massive scale. 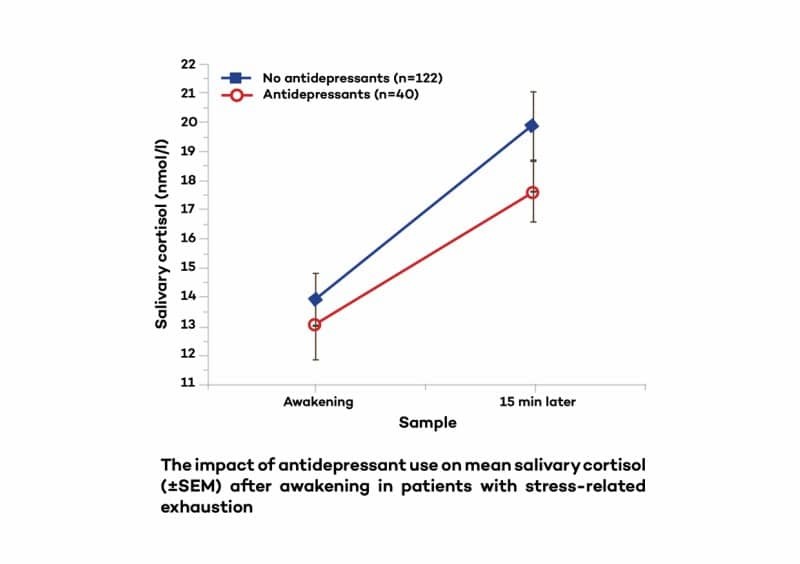 Many of the labs doing these cortisol tests didn’t instruct people to take their first saliva sample within the first 30 minutes of after awakening. So what this amounts to is that tens of thousands of people who have had cortisol testing for “adrenal fatigue” took their first saliva samples an hour or two hours into the morning, which misses the entire cortisol awakening response and gives a completely inaccurate cortisol reading. Specifically, it will give a much lower cortisol level than is actually the real amount of cortisol your body makes in the morning. I can’t emphasize enough how big of a blunder this is. 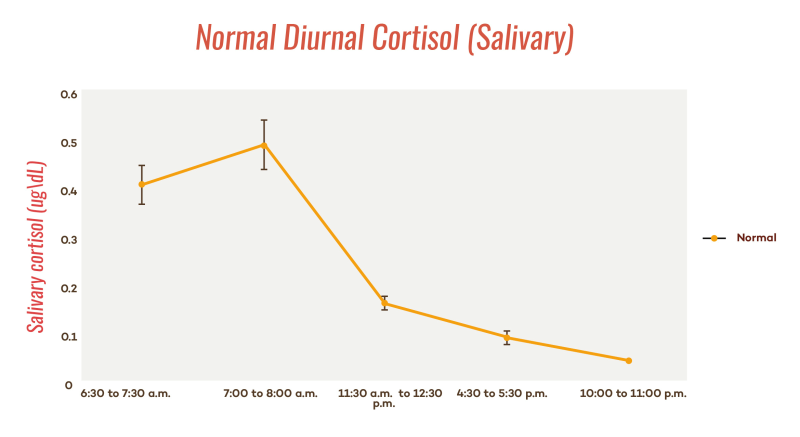 Accurate cortisol readings depend on the saliva sample being taken in the first 30 minutes after awakening. If you take your morning sample an hour or two after waking up, it is virtually guaranteed to get someone falsely diagnosed with low cortisol. It is likely that a sizable portion of people being diagnosed with low cortisol levels and “adrenal fatigue” actually have perfectly normal adrenal function and cortisol levels. One of the most glaring problems with the “adrenal fatigue” theory is that the claimed symptoms (of adrenal fatigue) do not actually match up with the actual symptoms that are accepted to be associated with low cortisol. You’ll notice that there are some of the symptoms on both lists – like fatigue, low blood sugar, depression, and cravings for salt. In addition, it’s also worth pointing out that the symptoms claimed for “adrenal fatigue” are significantly more common occurrences in regular healthy people, and are not specific to low cortisol states or people with chronic fatigue issues, such as weight gain, cravings for sugary foods, anxiety, waking up tired, and trouble sleeping. These are all symptoms that apply to large portions of the general population, and are not unique to people with chronic fatigue or low cortisol. Thus, a huge percentage of the general healthy population will identify with these symptoms. If you answered yes to even a few of these questions, he claims that this means you may have adrenal fatigue. Now look over that list closely. Do you anyone who wouldn’t at least say yes to at least a few of those questions, at least some of the time?! and then created a very broad list of general symptoms that even a large percentage of healthy people will identify with. So I decided to do a survey to get to the bottom of this discrepancy between the actual symptoms of low cortisol levels vs. the claimed symptoms of adrenal fatigue. I wanted to know if a population of people with fatigue – most of whom were convinced that they had “adrenal fatigue”(or have officially been diagnosed with it) – would actually identify with the real symptoms of low cortisol levels. I took a sample of over 600 people with fatigue and then simply presented them with the actual symptoms that are associated with low cortisol (see the list above). “Can I ask for your help with this little survey? It's a list of 12 symptoms, and I just want to know whether this list of symptoms feels like a good fit with YOUR symptoms, or if it doesn't seem like a very good fit. Do you read this list of symptoms and think "Wow, that sounds like what I have" or "No, that doesn't really sound like what I have." Please only say "Yes, this sounds like what I have" if you identify with at least 6 of the 12 symptoms. Otherwise, say "No, this doesn't really sound like it matches well with my symptoms"
This simple survey was designed to find out if people with fatigue (many or most of whom believe they have adrenal fatigue) would actually identify with the real symptoms of low cortisol levels. 77 of 621 people (12.4%) of people said that the symptoms of low cortisol are very similar to their symptoms. 544 of 621 people (87.6%) of people said that the symptoms of low cortisol are not similar to their symptoms. Well, simply put, it means that the vast majority of people with fatigue do not have the symptoms associated with low cortisol levels. Over 8 out of 10 people with fatigue do not identify with the symptoms of low cortisol levels. This is just one more piece of data to go along with dozens of actual scientific studies on this subject again suggesting that the vast majority of people with chronic fatigue do not actually have low cortisol levels. If most people with fatigue don’t have symptoms of low cortisol, it doesn’t make much sense to attempt to explain chronic fatigue by saying that it’s caused by low cortisol. This is particularly true in light of the fact that we have already seen from the actual studies that most people with chronic fatigue do not actually have abnormal cortisol levels. If studies don’t show low cortisol levels in the majority of people with chronic fatigue, and most people with chronic fatigue don’t identify with the symptoms of low cortisol levels, it simply does not make sense to keep focusing on cortisol as a valid way of explaining fatigue. Another problem with the “adrenal fatigue” theory is the rules (or lack of rules) many people are using to interpret cortisol tests. As you’ve now seen, cortisol levels are an extraordinarily bad predictor of whether or not someone is fatigued. A person who is completely exhausted and burned out from chronic stress may have high cortisol, or low cortisol or normal cortisol. As explained above, in the setting of any illness, this scenario should immediately get that biomarker ruled out as an invalid way of diagnosing a condition. Yet, many health practitioners still claim to diagnose “adrenal fatigue” based on cortisol measurements. The interesting thing that many people have done though, is basically rigged the game to virtually always come out with an adrenal fatigue diagnosis. If they have normal cortisol levels, they may be told they’re in an early stage or middle stage, before their cortisol levels decline. 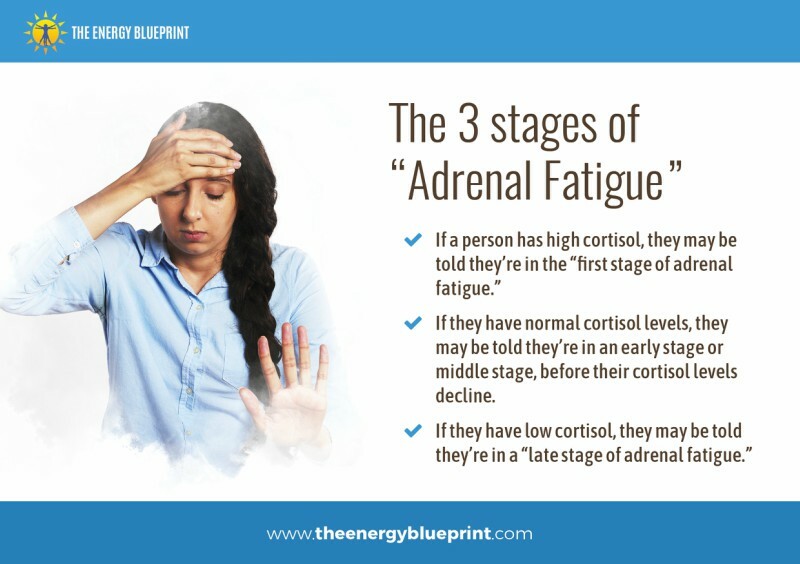 In other words, they’re using a diagnostic marker that can potentially always be used to claim that someone has “adrenal fatigue” – regardless of whether cortisol is high, low, or totally normal. (It’s important to note here that these supposed “phases” of “adrenal fatigue” are not validated by scientific research. Indeed, as we’ve seen in the research, cortisol levels do not have any reliable relationship to the severity of chronic fatigue). Again, in conventional medicine, in any scenario like this, this way of diagnosing people with a condition would immediately be recognized as scientifically invalid. A biomarker that is this inconsistently associated with a set of symptoms would immediately be thrown out as an invalid biomarker for that condition. This is another area where the adrenal fatigue theory just doesn’t make sense. The claim with adrenal fatigue is that the adrenals get burned out and then low cortisol levels produce fatigue and many other symptoms. Here’s why that’s a critical point to pay attention to: The supplements typically prescribed by alternative health practitioners to correct adrenal health don’t have scientific evidence showing that they raise cortisol levels. In fact, virtually all the evidence on virtually all of the supplements prescribed to people with “adrenal fatigue” have actually been shown in the research to lower cortisol levels! Obviously if the claim is that someone has low cortisol levels, it doesn’t make sense to prescribe things which are known to lower cortisol levels. The lone exception that works to potentially raise cortisol levels (by inhibiting cortisol conversion to cortisone) is licorice root. For all the other herbs and supplements commonly prescribed to people with low cortisol levels, the scientific evidence only shows that these substances lower cortisol levels! I am not aware of any studies that have ever shown that any of these substances work to increase cortisol. If the claim is that people with “adrenal fatigue” have symptoms due to low cortisol levels, it does not make sense to prescribe substances that are proven to lower – not raise – cortisol levels. Moreover, it also does not make sense to explain the benefits of these substances (which are real) through the lens of how they affect cortisol levels. (In reality, they affect many other systems of the body, including the brain, the immune system, inflammatory cytokines, and perhaps most importantly, the mitochondria (the energy generators in our cells)). To sum up: If low cortisol is the problem, it doesn’t make sense to prescribe substances that are proven to lower cortisol levels. Importantly, the studies assessing cortisol levels in various illnesses have almost universally failed to control for most or all of these variables. Thus the claims of how cortisol abnormalities are linked with various illnesses should be taken with a grain of salt. These are all major confounding variables in the studies which have tried to link abnormal cortisol patterns to various diseases (including chronic fatigue/burnout). What this means is that many of the supposed cortisol abnormalities in such diseases may simply be effects of symptoms of the disease (e.g. taking painkillers, poor sleep, or being physically inactive due to fatigue), rather than actual causes of the disease. Or they may simply be due to co-occurrences – for example, insomnia, depression, and excess body fat are all common co-occurrences in numerous different diseases. In other words, while the common thinking of adrenal fatigue proponents is to point to cortisol abnormalities as a causal factor in the disease, there is much research indicating that it may be a reversed direction of causation – that these symptoms and lifestyle factors (e.g. poor sleep, excess body fat, medication use, etc.) are causing the abnormal cortisol patterns, rather than the other way around. Moreover, I have literally never heard any health practitioner even mention these confounding factors when they analyze cortisol results of individuals they are working with. To give just one example of why this is problematic: Let’s take a person who has low morning cortisol levels and their doctor believes that it’s due to “exhausted adrenals.” In reality, it may simply be due to the fact that the person is a night owl and they typically go to bed very late and don’t sleep enough. Instead of addressing the person’s sleep hygiene habits, the doctor may prescribe hydrocortisone to treat the low cortisol levels. Of course, this mistake in treatment approach – treating the cortisol levels instead of treating the sleep habits – may have major health consequences over time. In short, while cortisol abnormalities may be a contributing factor in some conditions, the evidence being used to claim them as a causal factor is weak, and confounded by over a dozen variables. 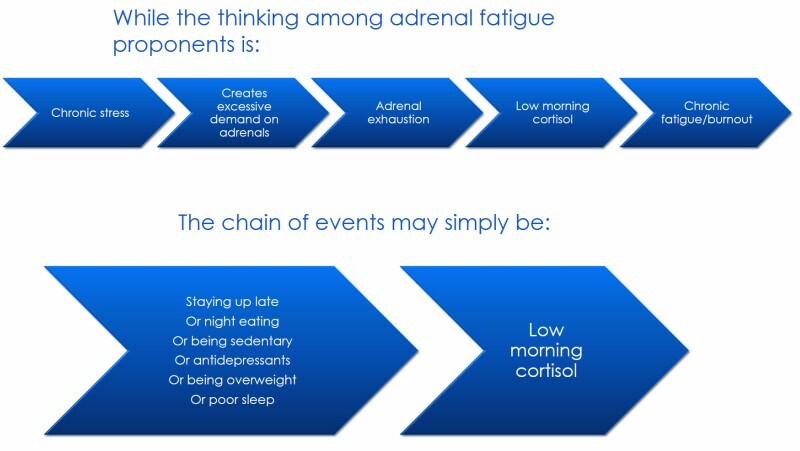 In the case of chronic fatigue, we should be very cautious with assuming that a low morning cortisol peak is valid evidence of any sort of “adrenal fatigue.” As discussed above, low morning cortisol levels may simply be an indication of a sedentary lifestyle, excess body fat, poor sleep, night eating, disrupted circadian rhythm, taking certain prescription or over-the-counter drugs, or simply staying up late. Virtually all of the research done trying to link cortisol levels with chronic fatigue (and most others diseases) is cross-sectional and thus, confounded by multiple factors that influence cortisol levels. So one should take such studies skeptically. As discussed above, in chronic fatigue/burnout, the case for a reversed direction of causation – i.e. the illness and behavioral consequences of it, cause cortisol abnormalities in some subset of patients – is more compelling than the case for cortisol abnormalities being a significant causal factor. In summary, the scientific evidence does not support the notion that adrenal function/HPA axis function/cortisol are a significant causal factor in chronic fatigue. The “adrenal fatigue” theory is not supported by the research. Studies have been conducted by researchers all over the world for over two decades examining whether adrenal/HPA axis dysfunction is a primary cause of chronic fatigue/burnout. 20 years of research into this has failed to show any type of HPA or cortisol abnormality that is reliably found in people with chronic fatigue/burnout. Overall, the research indicates that the majority of people with chronic fatigue/burnout have normal cortisol levels. Thus cortisol levels cannot reasonably be said to be the “cause” of chronic fatigue if it’s not even detectable in the majority of people with chronic fatigue. The research shows no clear link between cortisol levels and chronic fatigue/fibromyalgia/burnout. Some studies indicate increased cortisol in people with chronic fatigue/burnout, others show decreased cortisol, and the vast majority of studies show no differences in cortisol levels at all. Cortisol levels are not a valid biomarker of fatigue or burnout. 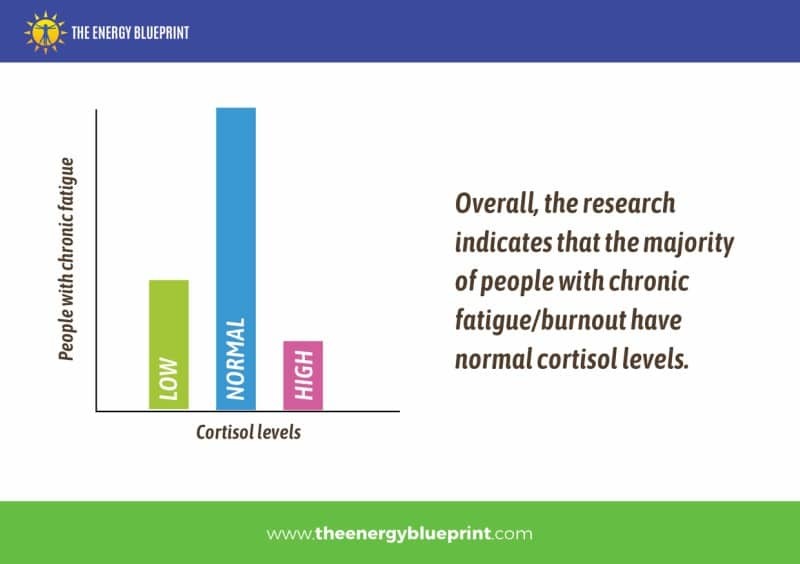 If poor adrenal function/low cortisol were the primary cause (or even a major cause) of chronic fatigue/burnout, we would expect to find that all (or at least a large majority of) people with chronic fatigue/burnout have low cortisol levels. Yet, the vast majority of people with chronic fatigue or burnout from stress have no cortisol abnormalities at all. Thus cortisol levels are not a valid biomarker of chronic fatigue. Cortisol levels measurements are not a valid way of diagnosing people with chronic fatigue/fibromyalgia/burnout vs. normal healthy people. There is no specific cortisol/HPA abnormality seen in these conditions, and no abnormality at all in most people. A small subset of people (likely between 15%-25%) with chronic fatigue/burnout have a lower morning peak in cortisol levels. (This lower morning peak in cortisol occurs as a result of many common variables – including being overweight or simple lack of sleep – and is not unique to chronic fatigue/burnout). There is no evidence to suggest that this low peak in morning cortisol is a causal factor, since it is not present at all in the majority of people with chronic fatigue/burnout. Even studies that do find cortisol abnormalities show only very slight abnormalities — and typically still show normal overall 24-hour cortisol output. Thus, there appears to be little to no evidence suggesting that the adrenals are incapable of producing enough cortisol. Low salivary cortisol levels are not actually evidence of “adrenal fatigue.” Research that assessing total 24-hour cortisol output via urine shows that the majority of people who have low salivary cortisol levels actually have normal total 24-hour cortisol production by the adrenal glands. There are no cortisol abnormalities present at the onset or early stages of chronic fatigue. 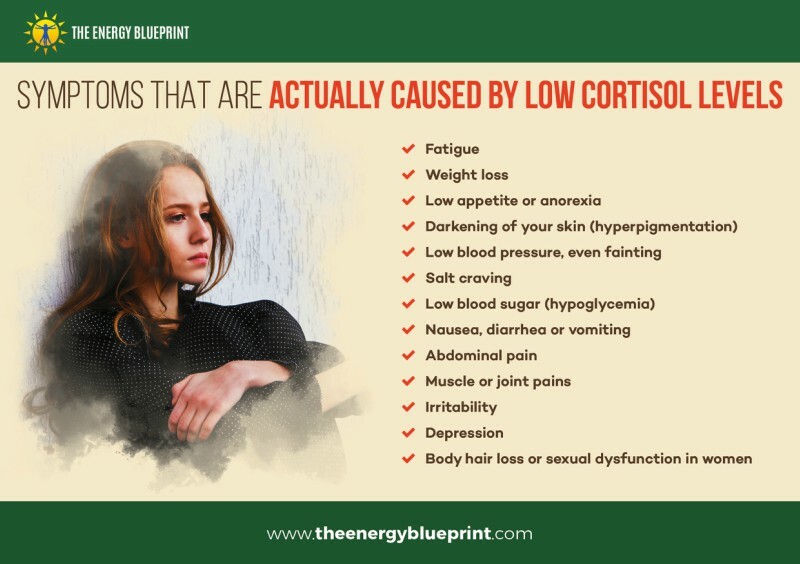 If poor adrenal function/low cortisol levels were a cause of chronic fatigue/burnout, we should expect to find low cortisol levels at the onset or early stages of these conditions. Yet, we do not find that. Thus poor adrenal function or low cortisol levels cannot reasonably be said to be a “cause” of chronic fatigue. Cortisol level measurements are not a valid way of assessing the severity of chronic fatigue. 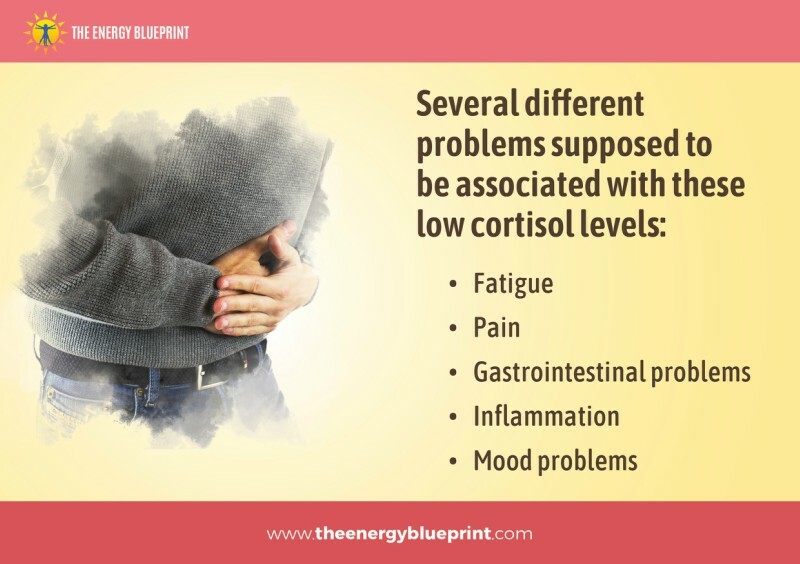 If cortisol levels were a major cause or contributor to chronic fatigue, we would expect to see a reliable relationship where the more severe the symptoms are, the larger the cortisol abnormality we would expect to find. Yet the research shows that cortisol levels are not a valid predictor of symptoms, and do not typically relate to symptom severity. Cortisol level measurements are not a valid way of assessing the cause of chronic fatigue. Cortisol level testing is useful for ruling out legitimate medical conditions like Addison’s disease and Cushing’s disease, but appears to be of little to no value in chronic fatigue/burnout. Cortisol level measurements are not a valid way of directing the course of treatment for chronic fatigue. Measuring cortisol levels to detect cortisol abnormalities is of little value in helping people with chronic fatigue, since treatments that target directly increasing cortisol levels have largely proven ineffective. Cortisol testing has many methodological flaws that can often lead to false diagnoses of low cortisol levels when a person doesn’t actually have low cortisol levels. The notion of “phases” of adrenal fatigue that have clear connections to specific levels of cortisol has not been validated by science. People with severe chronic fatigue may have high, low, or perfectly normal cortisol levels. 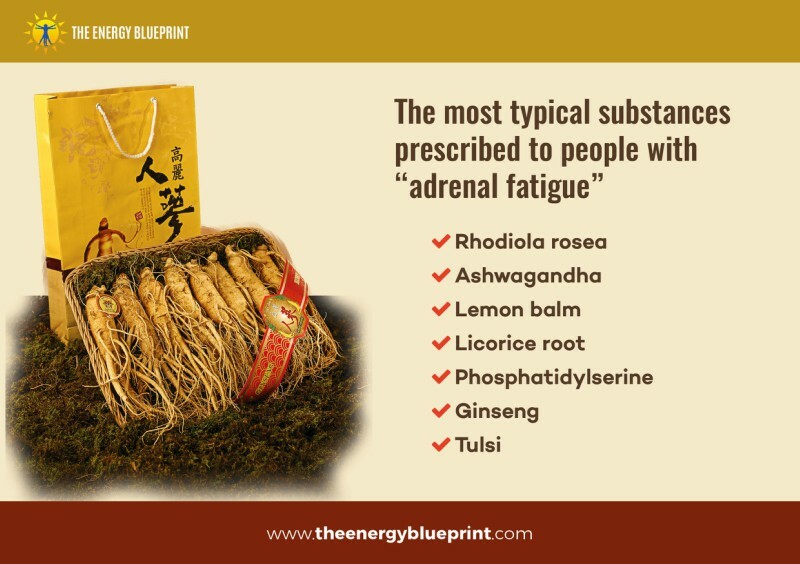 The adaptogenic herbs often prescribed to people who have been told they have “adrenal fatigue” are only shown in the scientific research to lower cortisol levels – not raise them. It does not make sense to prescribe substances that lower cortisol, if the claim is that chronic fatigue is being caused by cortisol levels that are already too low. The symptoms claimed for “adrenal fatigue” are vague and generalized symptoms that are not actually unique to low cortisol levels or chronic fatigue. (I.e. A large portion of the healthy general population will say “yes” in response to many symptoms listed on “adrenal fatigue” questionnaires found online). Lower cortisol levels – when they do occur in a small subset of people with fatigue – are almost certainly not the result of the adrenal glands being “fatigued” and unable to produce enough cortisol. If this was the case, we would see a pattern of high ACTH and low cortisol levels (as is seen in Addison’s disease), which indicates that the brain is calling for more cortisol to be produced but the adrenals are unable to produce enough. This hormonal pattern is not seen in chronic fatigue/burnout. Thus, the body is likely intentionally lowering cortisol levels and is producing exactly the amount it wants to be producing. (Again, this may be to allow inflammatory and immune responses to function well). The vast majority of people with chronic fatigue (over 85%) do not actually identify with the real symptoms of low cortisol levels. In the most generous scenario of giving some sort of importance to cortisol levels in chronic fatigue, in the subset of people with lowered cortisol levels, it is possible that this hormonal abnormality may be perpetuating the condition by creating additional symptoms and/or making recovery more difficult. Even this has not been validated by research, however. Moreover, the fact that raising cortisol levels (via hydrocortisone) fails to reliably give benefits – even to those with lower cortisol levels – suggests that cortisol levels are of minimal importance in chronic fatigue. A lowered morning peak in cortisol levels is something that arises in numerous different conditions, and is not unique to chronic fatigue/burnout. A lowered morning peak in cortisol levels is not evidence of “adrenal fatigue,” since it can be found in healthy, non-chronically fatigued people who are simply sleep deprived, sedentary, on certain medications, or are night owls. Cortisol levels typically do not change in response to interventions that improve symptoms and/or normalize health. If cortisol levels were the major causal factor of the symptoms in chronic fatigue/burnout, we would expect to see a reliable relationship where, as symptoms improve, so do cortisol levels. Yet, the majority of intervention studies that have shown significant improvement in symptoms (e.g. energy levels) typically show that there are no changes in cortisol levels that parallel these symptom improvements. Fixing cortisol levels does not fix the fatigue. This is even true in people with lower morning cortisol levels. If low cortisol were the fundamental cause (or even a major cause) of chronic fatigue/burnout, then raising cortisol levels would improve symptoms dramatically. (As it does in true adrenal insufficiency/Addison’s disease). Yet, raising cortisol levels (via medication) does not significantly improve symptoms when compared with placebo treatment. (And it may be harmful in the long run). The vast majority of people with chronic fatigue or burnout from stress have no cortisol abnormalities at all. Cortisol abnormalities are not present at the onset or early stages of chronic fatigue. Based on the research, it appears likely that cortisol abnormalities (in the minority of people where they occur) may be just an epiphenomenon that results from being a night owl, taking antidepressants, inactivity, being overweight, or having sleep problems. The majority of intervention studies that have shown significant improvement in fatigue typically show that there are no changes in cortisol levels that parallel these symptom improvements. Interventions in people with chronic fatigue/burnout that directly target the cortisol abnormalities and raise cortisol levels (e.g. hydrocortisone) do not significantly improve symptoms vs. placebo. So is “adrenal fatigue” real? Overall, the theory of “adrenal fatigue” is not supported by the scientific evidence. The theory was logical and appeared to make sense on many levels. Unfortunately, 20 years of research have failed to validate the theory. Moreover, many lines of evidence overtly contradict the notion that adrenal/HPA function or cortisol levels are a primary factor in chronic fatigue/burnout. If we are going to truly find effective answers to chronic fatigue, we must let go of outdated concepts that aren’t supported by the evidence. I humbly suggest that if we want to make real progress in helping people with chronic fatigue, we must move beyond the “adrenal fatigue” theory and stop focusing on the adrenals/cortisol as thought it is the central cause in chronic fatigue. Overall, the body of scientific research suggests that the focus on cortisol levels as the key factor in chronic fatigue is extremely misguided. My hope is that this review of the research will help to shift the paradigm of how we approach treating chronic fatigue/burnout, and to help individuals struggling with chronic fatigue/burnout to find the best, evidence-based path to fixing their fatigue. Newman T. 2016 Adrenal Fatigue: Does It Exist? What Is Adrenal Insufficiency? Cadegiani FA et al. (2016) Adrenal fatigue does not exist: a systematic review. Morris G, et al. (2016) Hypothalamic-Pituitary-Adrenal Hypofunction in Myalgic Encephalomyelitis (ME)/Chronic Fatigue Syndrome (CFS) as a Consequence of Activated Immune-Inflammatory and Oxidative and Nitrosative Pathways. Oginska H., et al. (2010) Chronotype, sleep loss, and diurnal pattern of salivary cortisol in a simulated daylong driving. Merikanto I., et al. (2015) Eveningness relates to burnout and seasonal sleep and mood problems among young adults. Goel N., et al. (2009) Circadian rhythm profiles in women with night eating syndrome. Späth-Schwalbe E., et al. (1992) Nocturnal adrenocorticotropin and cortisol secretion depends on sleep duration and decreases in association with spontaneous awakening in the morning. Leese G., et al. (1996) Short-term night-shift working mimics the pituitary-adrenocortical dysfunction in chronic fatigue syndrome. Morriss R., et al. (1993) Abnormalities of sleep in patients with the chronic fatigue syndrome. Fossey M., et al. (2004) Sleep quality and psychological adjustment in chronic fatigue syndrome. Le Bon O., et al. (2000) How significant are primary sleep disorders and sleepiness in the chronic fatigue syndrome? Tell D., et al. (2014) Day-to-day dynamics of associations between sleep, napping, fatigue, and the cortisol diurnal rhythm in women diagnosed as having breast cancer. Grossi G., et al. (2015) Stress-related exhaustion disorder–clinical manifestation of burnout? A review of assessment methods, sleep impairments, cognitive disturbances, and neuro-biological and physiological changes in clinical burnout. Cleare AJ. et al. (1999) Low-dose hydrocortisone in chronic fatigue syndrome: a randomised crossover trial. Blockmans D., et al. (2003) Combination therapy with hydrocortisone and fludrocortisone does not improve symptoms in chronic fatigue syndrome: a randomized, placebo-controlled, double-blind, crossover study. a1 Bearn J., et al. (1995) Neuroendocrine responses to d-fenfluramine and insulin-induced hypoglycemia in chronic fatigue syndrome. a2 Yatham LN., et al (1995) Neuroendocrine assessment of serotonin (5-HT) function in chronic fatigue syndrome. a3 Dinan TG., et al. (1997) Blunted serotonin-mediated activation of the hypothalamic-pituitary-adrenal axis in chronic fatigue syndrome. a4 MacHale S.M., et al. (1998) Diurnal variation of adrenocortical activity in chronic fatigue syndrome. a5 Strickland P., et al. (1998) A comparison of salivary cortisol in chronic fatigue syndrome, community depression and healthy controls. a8 Scott LV., et al. (1998) Naloxone-mediated activation of the hypothalamic-pituitary-adrenal axis in chronic fatigue syndrome. a9 Scott LV., et al. (1998) Blunted adrenocorticotropin and cortisol responses to corticotropin-releasing hormone stimulation in chronic fatigue syndrome. a12 B Wood., et al. (1998) Salivary cortisol profiles in chronic fatigue syndrome. a15 Cleare AJ. et al. (1999) Low-dose hydrocortisone in chronic fatigue syndrome: a randomised crossover trial. a16 Cleare AJ. et al. (2001) Hypothalamo-pituitary-adrenal axis dysfunction in chronic fatigue syndrome, and the effects of low-dose hydrocortisone therapy. a18 Moch SL., et al. (2003) Longitudinal changes in pituitary-adrenal hormones in South African women with burnout. a20 Blockmans D., et al. (2003) Combination therapy with hydrocortisone and fludrocortisone does not improve symptoms in chronic fatigue syndrome: a randomized, placebo-controlled, double-blind, crossover study. a26 Langelaan S., et al. (2006) Do burned-out and work-engaged employees differ in the functioning of the hypothalamic-pituitary-adrenal axis? a28 Mommersteeg PMC., et al. (2006) Cortisol Deviations in People with Burnout Before and After Psychotherapy; a Pilot Study. a30 Langelaan S., et al. (2006) Do burned-out and work-engaged employees differ in the functioning of the hypothalamic-pituitary-adrenal axis? a32 Tops M., et al (2007) The Psychobiology of Burnout: Are There Two Different Syndromes? a35 Nater UM., et al. (2008) Alterations in diurnal salivary cortisol rhythm in a population-based sample of cases with chronic fatigue syndrome. a37 Nater UM., et al. 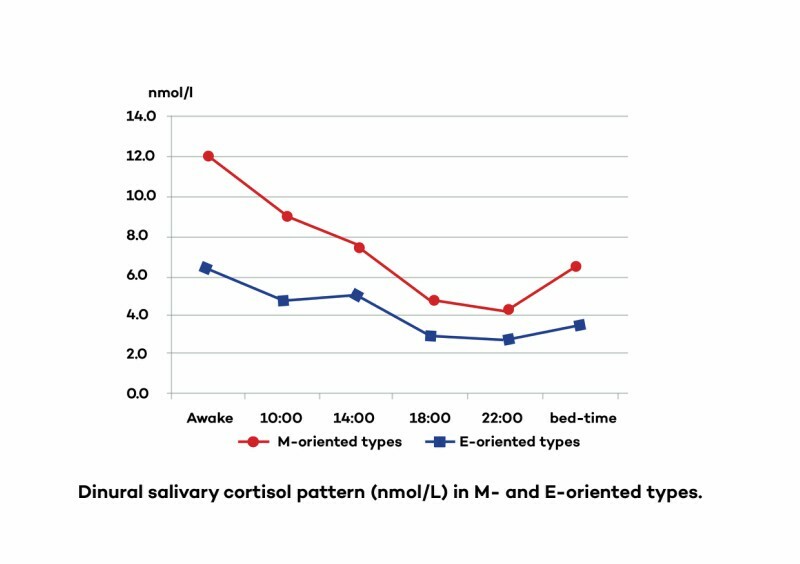 (2008) Attenuated morning salivary cortisol concentrations in a population-based study of persons with chronic fatigue syndrome and well controls. a42 Riva R., et al. (2010) Fibromyalgia syndrome is associated with hypocortisolism. a45 Roberts ADL., et al. (2009) Does hypocortisolism predict a poor response to cognitive behavioural therapy in chronic fatigue syndrome? a51 Marchand A., et al (2014) Burnout symptom sub-types and cortisol profiles: What’s burning most? a54 Alghadir AH., et al. (2015) Physical activity and environmental influences on adrenal fatigue of Saudi adults: biochemical analysis and questionnaire survey. b1 Parker AJ., et al. (2001) The neuroendocrinology of chronic fatigue syndrome and fibromyalgia. b6 If it goes up, must it come down? Chronic stress and the hypothalamic-pituitary-adrenocortical axis in humans. b8 Tanriverdi F., et al (2007) The hypothalamo-pituitary-adrenal axis in chronic fatigue syndrome and fibromyalgia syndrome. b12 Geenen R., et al. (2010) Deviations in the endocrine system and brain of patients with fibromyalgia: cause or consequence of pain and associated features? 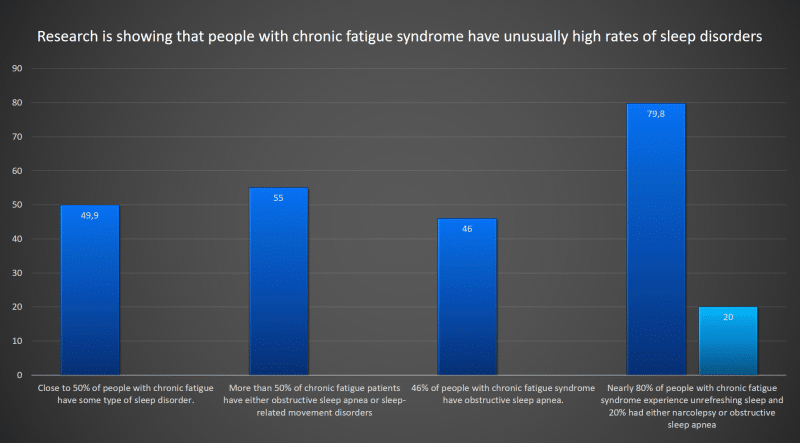 So what causes chronic fatigue syndrome? Sounds like most people are just getting the terms confused. Thanks for sharing all your work. That took committment! Indeed it did. Thanks Tricia! Hope you enjoyed it and found it insightful! What a comprehensive study. Well done. I follow your work with great interest and appreciate all the energy you devote to providing such enlightening information. When you look in the wrong place you will never find what you are looking for. Absolutely right, June! And hopefully this article will save many people from wasting a lot of time, money, and effort doing things which aren’t rooted in science. You are mixing adrenal dysregulation with CFS and trying to prove that because there is no link between the two in the literature then adrenal dysregulation does not exist… These two things can be related or not… It is very possible (and common) to have adrenal (hormonal, in other word) dysregulation. I think calling it adrenal “fatigue” was a mistake, but those days are gone, adrenal dysregulation does exist, just like cyrcadian or other metabolic dysregulations… What causes it might be more complex than initially thought but nevertheless is out there. Thanks for your comment. It appears you haven’t fully read or fully understood the article. As explained in the article, there are subsets of people who do have cortisol abnormalities (what you are referring to as “adrenal dysregulation”). So yes, this does exist. This article does not argue that such cortisol abnormalities do not exist. Rather, it argues that the science does not support the notion that cortisol abnormalities (“adrenal dysregulation”) are the primary cause of chronic fatigue/burnout. I agree with you that terming it “adrenal fatigue” was a mistake. Adrenal dysregulation or HPA axis dysfunction are better terms, but even there, the science doesn’t support the notion that adrenal dysregulation/HPA axis dysfunction are primary causal factors in chronic fatigue/burnout. There is much research to show that those factors can induce a low morning peak in cortisol levels (i.e. “adrenal dysregulation”). It appears that you didn’t read the full article, so you may want to check out those sections on the factors that can cause a lowered morning peak in cortisol levels, and the research discussing the reversed direction of causation. So yes, cortisol abnormalities do exist, but their importance in chronic fatigue/burnout has been greatly overestimated. Thank you for the work that it took to conduct this extensive review. Glad you enjoyed it, Gail! And I hope it was helpful to you! Hi Ari…grateful thanks for producing and sharing such an intensive review of such an extensive topic so objectively. I need to read it more in detail to understand it better. With great appreciations. . Very interesting, thank you Dr Alan Christianson has also been making similar comments about the naming of the condition. oops! Sorry have just finished reading long list at end and A Christianson is noted. Should read everything first. Thanks again – very interesting. Kudos to you Ari for the depth of research, the analysis, the insights and the clear presentation of the facts you have gathered. I can’t give you enough thanks. And I am now so relieved that I did not let practitioners prescribe thyroid or hormonal preps to my teenage daughter when she developed chronic fatigue. It felt wrong. It is so important that we come to understand, as you pointed out in the presentation, that testing methods are themselves somewhat questionable, our results differ at different times and reference ranges are not truly indicative of ones true health status. Now…..would you be willing to tackle Reverse T3. Almost 9 years testing at over the top of the recommended scale . Is the scale acceptable? Is very elevated Reverse T3 indicative of something specific? Can/should something be done about it? Oh, and then there is the whole cholesterol debate. A bit like cortisol….I believe we all have levels that our body makes as dictated by your size, diet, activity, genes and lifestyle. But still apparently everyone needs statins! ? we all need to be in the NORMAL range! Thanks so much for your comment, and glad you enjoyed the article! One thing I should point out is that just because cortisol testing has some methodological flaws, it doesn’t necessarily mean that other tests for other hormones are necessarily flawed (some are, and some aren’t). So if a true hormonal dysfunction (e.g. hypothyroidism) has been detected in your daughter, I would suggest treating that. Cholesterol is a tricky subject that is still being hotly debated. I don’t think the evidence is strong that statins decrease mortality, and I personally wouldn’t recommend them for most people because they will cause mitochondrial damage over time. Even though a lot of research was reviewed, it seems it was still done in a siloed manner. No mention was made of the relationship of the adrenals with the thyroid or the adrenals/thyroid with the liver. Issues with either the thyroid or liver would explain continuing fatigue despite treating the adrenals. The ideas you’re proposing (i.e. research reviewing any sort of link between adrenal dysfunction and thyroid/liver health) would largely fall into the speculative category. Even though certain popular health authors have suggested such ideas, there is virtually no scientific research to speak of that actually examines potential links (i.e. adrenal-liver or adrenal-thyroid) or proposes that such a link plays a major role in chronic fatigue/burnout. The studies that have examined adrenal function as it relates to chronic fatigue/burnout — including those that measure thyroid hormones — are actually all reviewed in this article. Incredible, thank you! Your analytical detective work to untangle all the different angles and truly get to the bottom of the different conclusions (a lot harder than “cherry-picking”!) is truly fascinating, and raises the bar for such analyses! Thanks so much, Sam! I really appreciate that! By the way, I have found out the answer to the question I asked you about caffeine on your previous master-class. Aug 15, 2017 – August 15, 2017 by E.j. Mundell, Healthday Reporter. (HealthDay)—The number of Americans who say they’ve taken an antidepressant over the past month rose by 65 percent between 1999 and 2014, a new government survey finds. Many thanks for your work on this research linked article. Most definitely, HT. I think antidepressant use, being a night owl, and sleep disorders are MAJOR confounding variables in such studies, and may even be the primary reasons for low cortisol levels. Yes, there is research to suggest that Prozac may have some negative effects on mitochondria. Thanks so much for all that labour of love. Greatly appreciate the time involved and your generosity to share so liberally with us. I am one who profits best on information if I know the whys and hows. Great work!! Thanks so much, Chrystene! Glad you enjoyed the article. Glad you enjoyed the article, Elen! I should add that it’s possible to have serious medical conditions — i.e. Addison’s or Cushing’s disease — that involve true adrenal dysfunction. Apart from those conditions, yes, based on the evidence, I believe that it is very likely that most people’s cortisol abnormalities are not the result of adrenal dysfunction, but simply of common lifestyle factors like being a night owl, being overweight, being sedentary, being on certain medications, poor sleep, etc. If cortisol is not that important then why does your friend Dr Alan Christianson publish a book “The Adrenal Reset Diet” which seems to say the opposite, it seems to say he uses cortisol levels to diagnose patients? He is of a different view than I am. I have many friends who I don’t always agree with on every aspect of what they write, though in the case of Dr. Christianson, we are in agreement on about 90% of things. On this issue, Dr. Christianson still believes that “adrenal fatigue” is not a real condition and that it’s really HPA axis dysfunction. HPA axis dysfunction is a real thing, and it’s possible for people to have abnormal cortisol levels (as I explained in this article). So on that point, I actually agree. But while cortisol abnormalities are real and do occur in a subset of people, this article simply examines the science to evaluate whether or not cortisol abnormalities are the central cause of chronic fatigue/burnout. As the article concludes, while HPA axis dysfunction/abnormal cortisol levels are real, they do not appear to be the primary cause of chronic fatigue/burnout and likely arise as secondary factors. If one is in the subset of people who have abnormal cortisol levels, it is feasible that correcting cortisol levels — primarily through addressing the lifestyle factors mentioned in this article that cause low morning cortisol, such as being a night owl, taking certain medications, not being sedentary, losing excess body fat, and correcting sleep problems — may help alleviate some symptoms and help in recovery. Though again, most people with chronic fatigue syndrome or burnout syndrome do not appear to have cortisol abnormalities. I’ve written many articles and done many videos, and many podcasts on helpful solutions. If you’d like to see my free training where I go over the primary causes of fatigue and many actionable strategies to overcome fatigue, you can enter your email on the home page of our site. Where is the home page of your site? I would like some strategies. And, I am not really concerned with is it, or is it not real. Either way, some solutions to just feel better. Thank you for this exhausting work. I can’t imagine how many hours you have in this. It is clear I was misguided and it’s a relief to let the whole adrenal fatigue theory go. However, are we any closer to understanding the root cause of chronic fatigue or burnout, not including the items you mentioned that apparently cause low morning cortisol levels? Most definitely. There are many more accepted theories of chronic fatigue with lots of evidence behind them. For some people, it may provide some alleviation of symptoms initially and help to “prop up” a person temporarily as other things are worked on. As you can see from the evidence here, the research doesn’t really support it — especially when used long-term. Moreover, the research indicates that any benefits one gets from it stop as soon as one goes off the medication. To go even further, I frequently hear from people who were put on hydrocortisone by their doctor that they are now months or years into it, and have experienced all sorts of nasty side effects, plus, now have a terrible time weaning off. So overall, I am not a fan. If you do use it, I suggest keeping it low dose and short-term. I suggest avoiding the slippery slope of larger doses and taking it for longer periods of time — it may very well do more harm than good. Having said all of that, I have to always say, please follow your doctor’s advice on what to do. I will just add that if your doctor’s advice is not aligned with the evidence presented here, then get a second opinion from another doctor. I’ve heard some docs give long term low dose cortisone so your research is very much appreciated. I’ll now never do that. All your info on cortisone was so interesting. I’d just like to say kudos for such an in-depth review of the literature showing a clear lack of consistent evidence supporting the concept of adrenal fatigue. It didn’t come as news to me, as I’ve been aware of it being a myth for a few years now, but it was clearly the most extensive piece of work disproving this die-hard myth that I’ve come across to this day. You’ve really really done your homework and that for I commend you big time ! Thanks so much, Marc! Really appreciate that! Thanks for the research. The main thing I appreciate about you is that you tend to remain skeptical of the unsupported claims that people make as they try and push their products as helpful for all kinds of conditions. Having lived with CFS for over 20 years and in so many different formats, one gets tired of people trying to sell one cure after another. I keep trying one thing after another and if I hadn’t had to suffer so much it would be quite interesting. For 18 months until November of last year I was between 20 – 50% functional and then it was like someone flipped a switch and I was 50-70% functional. That lasted for one month and down the rabbit hole I fell even further. Now I am between 10-30% with fatigue I title soul crushing. I have had similar rebounds in the past but it is hard as hell for me to identify cause and effect. Anyway, I don’t know if you were aware of this recent study linking the HPA axis with the immune system. So instead of there being adrenal fatigue with true CFS, there is neuro-immune disregulation. Yes, I have seen that research. There have been a number of studies that have shown immune system and inflammatory abnormalities in people with CFS. I am skeptical of the claim that these changes are reliably associated with high cortisol levels as is implied in the article you linked to, for the reasons explained in my article here: High cortisol levels (and HPA abnormalities of ANY kind) are not found in the majority of people with CFS. So I think continuing to look to the HPA axis as a place where we’ll find answers is misguided. But thanks again for the kind words, and for sharing! P.S. Have you tried The Energy Blueprint to get help with overcoming your CFS?